Our week that was… been a tough week in all honesty, tiredness really taking its toll, anxiety levels a little elevated, general grumpy demeanour this week..
Its been about 4 years since we last went, and wow, there have been some great additions the the venue. This truly is a place to visit if you can and I feel excellent value for money. 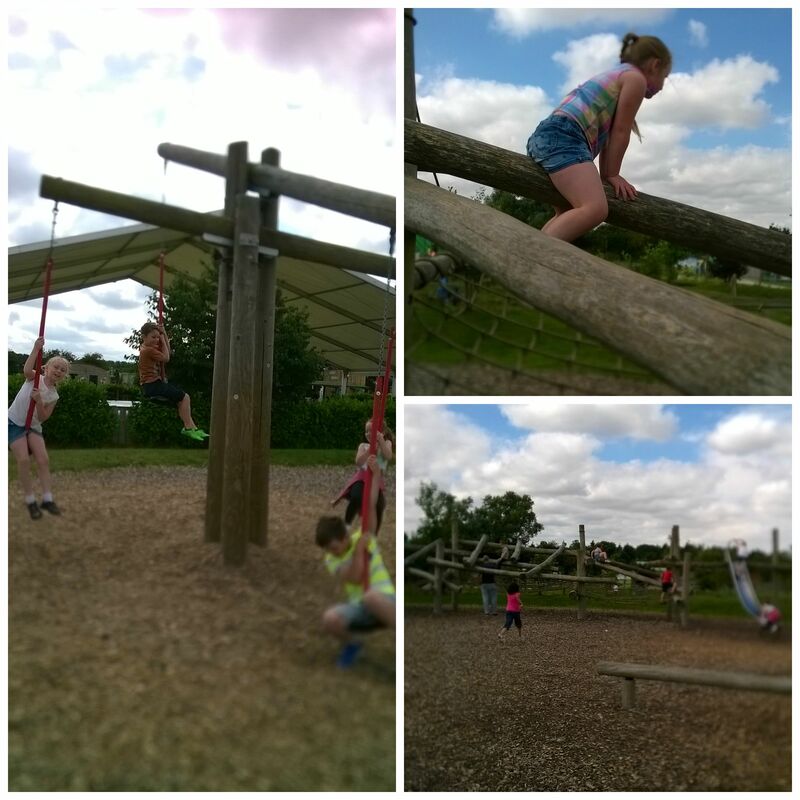 Went with friends and their kids, weather was good, loads to do, list is a long one, so thought the pictures may give a better view of everything on offer. Spending a night at A&E. 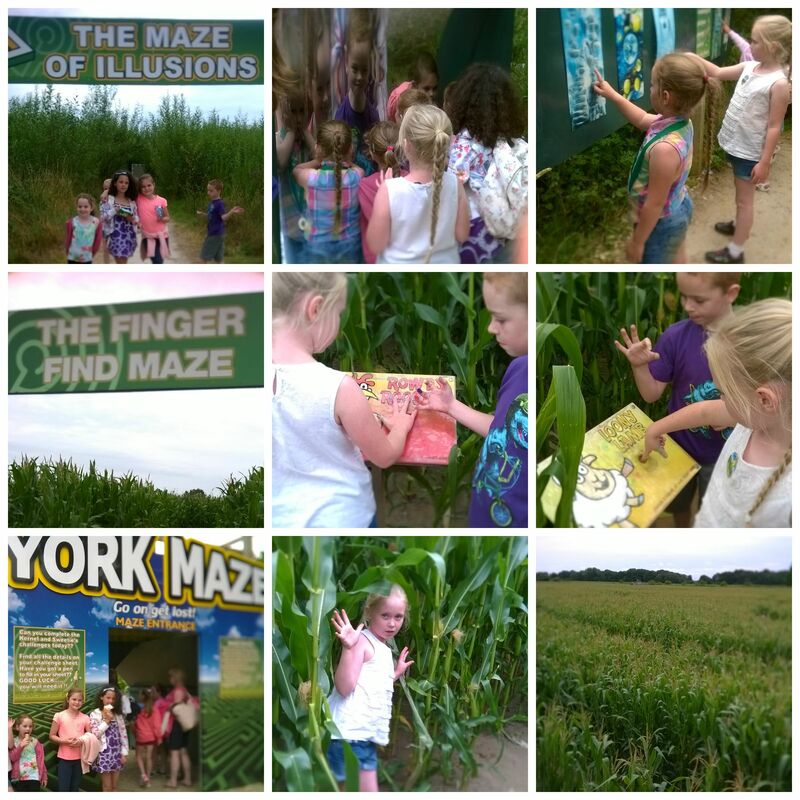 Natalie went over on her ankle at York Maze – being a bit enthusiastic on the bouncy pillow. We had a few tears at the time, but a quick inspection of the foot, wiggling of toes and rotating of the ankle, I thought she’d survive. 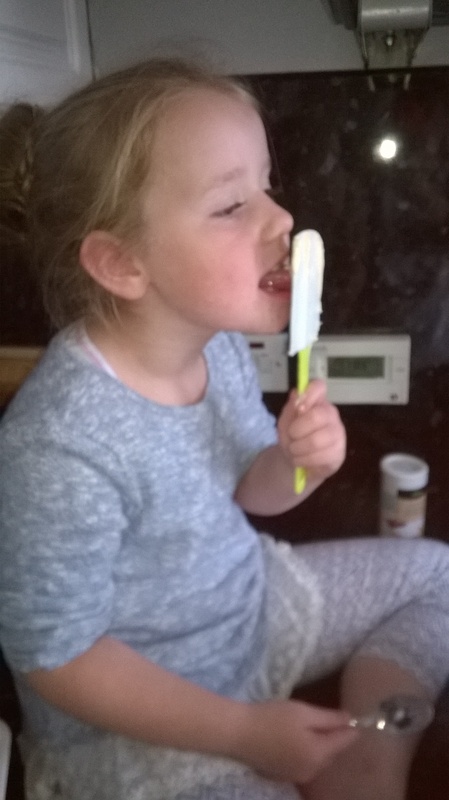 She solidered on for the rest of the afternoon with a bit of a limp but without complaint (my kids are used to not complaining.. I’m not the most patient when it comes to potential injuries, unless its dropping off, then stick a plaster on it and get on with it). 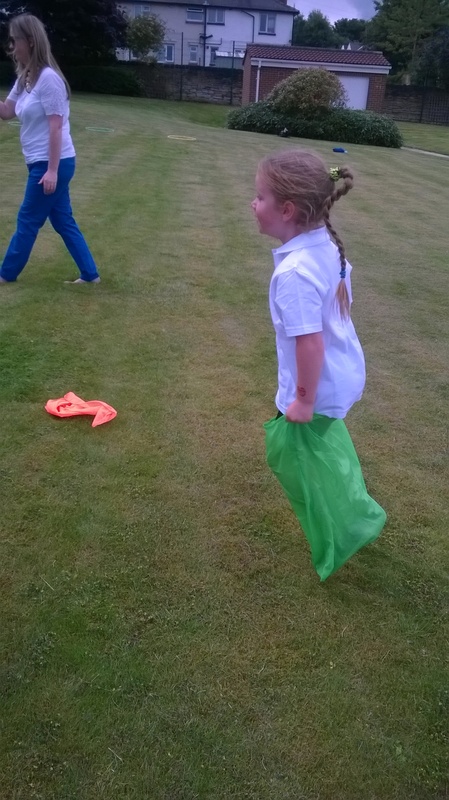 That evening, getting them ready for bed, socks pulled off – minutes later her ankle had ballooned! .. despite the lateness in the evening, figured it should be checked out and bundled kids to the car and took them to the local minor injuries unit. Arrived there at 9.02pm (by their clock on the wall), to be turned away as their X-ray dept shut at 9.00pm. (Disgruntled would be an understatement!) 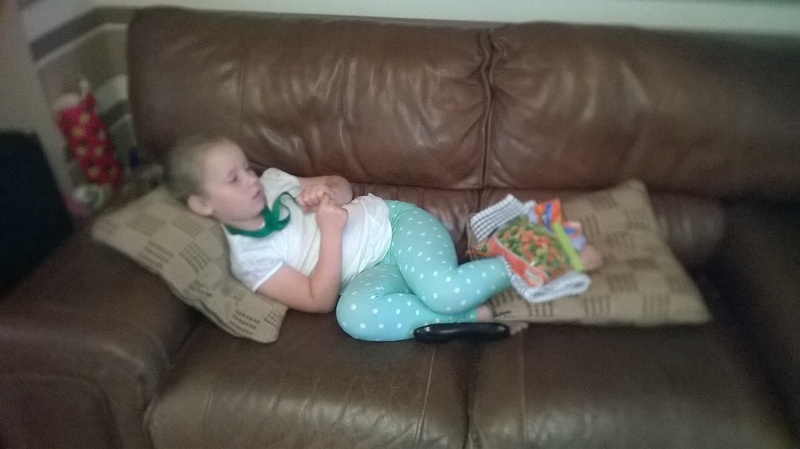 So made the journey to a main Hospital A&E – 5hrs, one X-ray, and 2 very tired and fed up children later we were told it was a sprain, treat with a bag of frozen peas and keep it moving. Arrived home at 3am! Made it through Soap & Suds week at Mini Mess without any accidents, injuries or mishaps. This is the week that I fear the most. 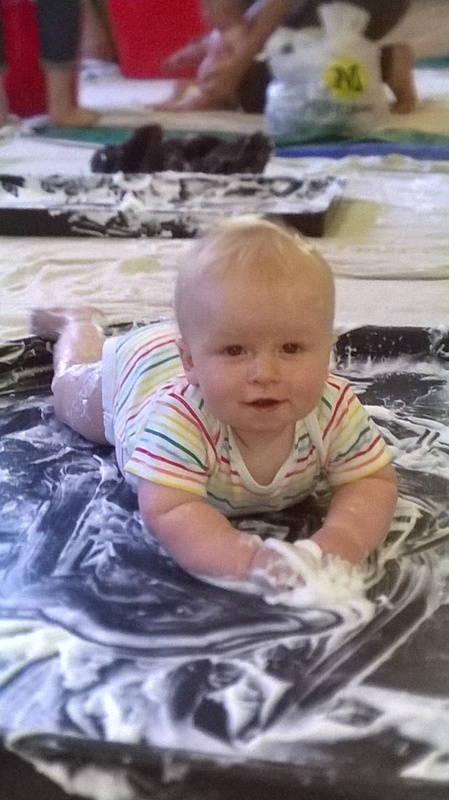 Regardless of the risk assessments I complete on the activity, despite the health and safety precautions and warnings I make, its always a worry that given the nature of soap (slippy, slidey), that something might happen… but phew..it didn’t. No let up with the insomnia – it really is starting to grind me down. 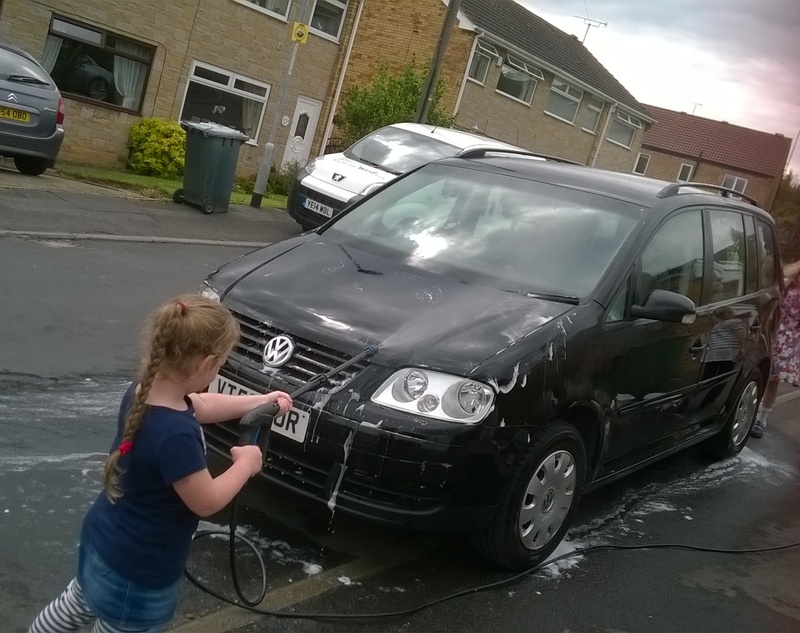 A bit of a get together with friends and an impromptu pamper time with them and the kids. 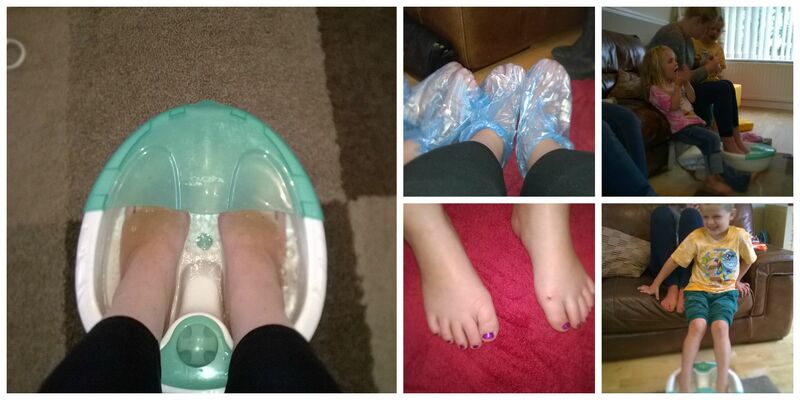 Footspas, mini pedicure, painting of nails along with a natter and catch up. My grumpiness this week. 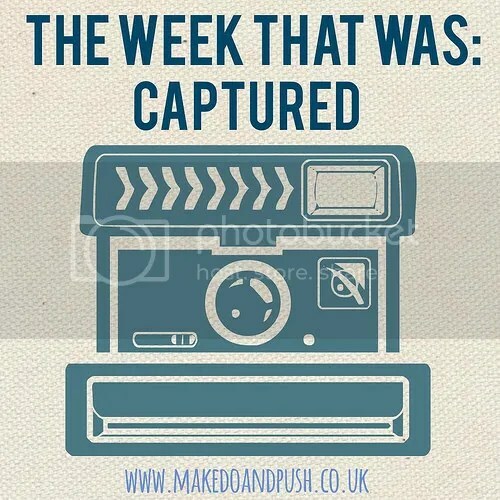 Its been a tough week.. maybe as we are in to week 4 of the holidays and having to constantly juggle work and home, keep the kids entertained, keep some sort of eye on the budget, all whilst having very little sleep is taking its tole. More than usual I’ve found my current living arrangements with hubby a strain. Trying hard not resent being in a marriage, but for all intents and purposes still a single parent very hard. The whole trip to A&E on my own with two kids a prime example. Normal married couples would’ve had a partner there to help – hmm.. but not me. I know it will all come ok eventually, its just this week ‘eventually’ seems an awful long way away. Ramping up the marketing activity for resuming classes in September. 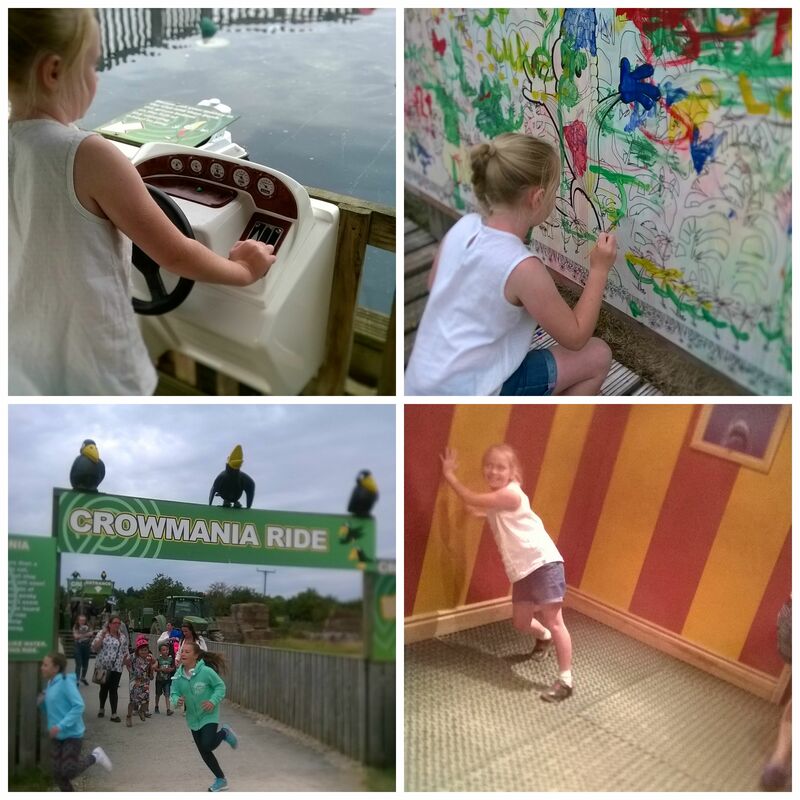 I reduce my work load considerably over the summer to allow myself more time with the kids whilst they are off school. But being more than half way through the holidays now, thinking has had to return to business. This has meant starting to put together, plan and start some activity to promote classes in September. A random act of romance from Hubby. We eat out fairly often.. we are a couple that like our food! But generally its just a quick decision, lets go out to eat tonight. However, this week, with us taking on the competition challenge of seeing how many random acts of romance we can do for each other for the remainder of the month, Ron took it upon himself to make an advance reservation, not only that but at my fav restaurant ( and one that is not particularly his I might add). He didn’t tell me where we were going, drove a totally different way to keep me guessing, and I have to say, was a total surprise when we rocked up outside. What was the most touching, was not only had he gone to the trouble to book a table, keep it a secret, but had taken me out to a place I love, for my absolute favourite food, despite the fact that in all honesty, its the type of food he can take or leave. To top if off, on the way home he made a detour past Passion Gelato to pick up deserts we could eat later at home ( alot later I might add.. we were stuffed). BIG score for him on the romance front. The NHS. For as disgruntled as I was at being turned away from Minor Injuries, and for as much as I had totally lost the will to live after 5hrs at A&E – at least I was able to get my daughter seen, treated and cared for – more than many many families and children get.. and for this, I am very very grateful. Here’s to next week.. bring it on! Trying to instill good strong values in my kids is sometimes a bit of an uphill struggle. The saying of please and thank you we have managed, sharing is often still a work in progress, learning that you have to work for things, to earn them.. well.. that one is most definitely still in its early stages. Back in the old days (heavens, I sound like my mum), you got new stuff at birthdays and Christmas, you didn’t get loads of ‘stuff’ inbetween, and if there was something you wanted, it went on your Christmas list, or you saved good and hard all your pocket money to get it yourself. Things are very different nowadays – everything is instantaneous – or so it feels. Its usual and ordinary for kids to get what they want, when they want it. I know myself when it comes to trying to put a Christmas list together with them its almost impossible as they’ve already got/had everything as the year has gone on. I really want my girls to understand the value of said ‘stuff’, to know that in order to have ‘stuff’ it has to be paid for, and the money used to pay for it has to be earned. 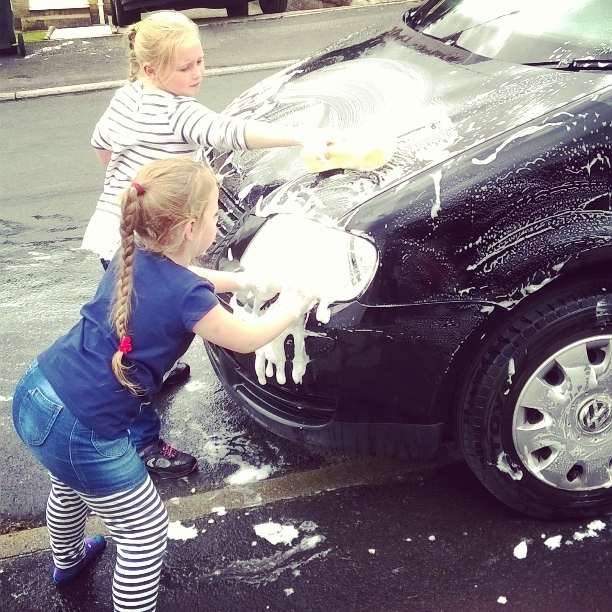 Currently they don’t get a regular pocket money amount each week, but they do have chores they have to do everyday (see prev blog post Sharing the Workload). 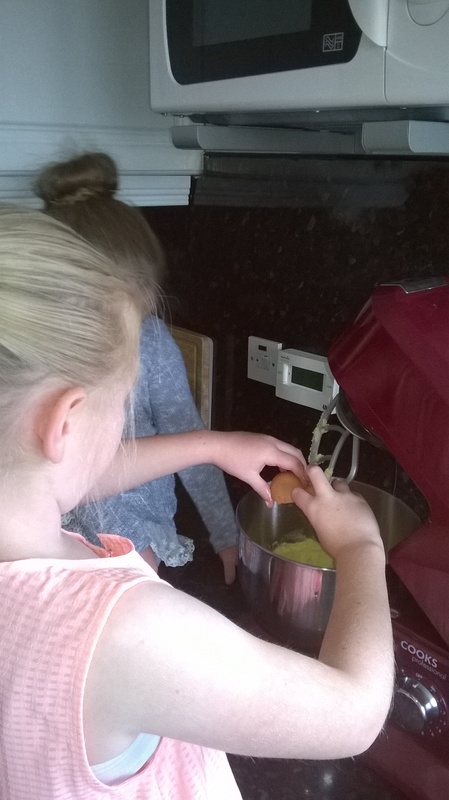 So this week saw the introduction of pocket money – £2.50 per week each (wasn’t sure of amount to give – not sure if I’m being a bit tight) but for this they have to do jobs. 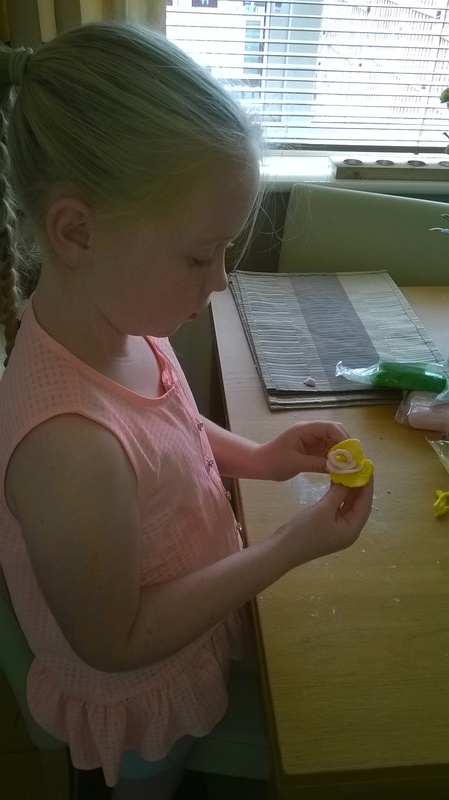 They have now a money box each, and each Sunday, if all jobs have been completed, they will be given their £2.50 to put in their box, and the responsibility will be with them how it is spent. 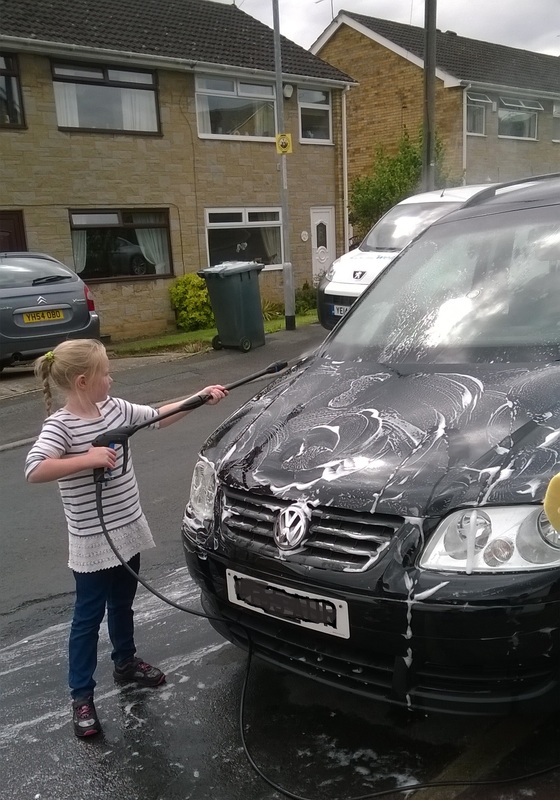 One of the jobs they had to do this week – wash the car. 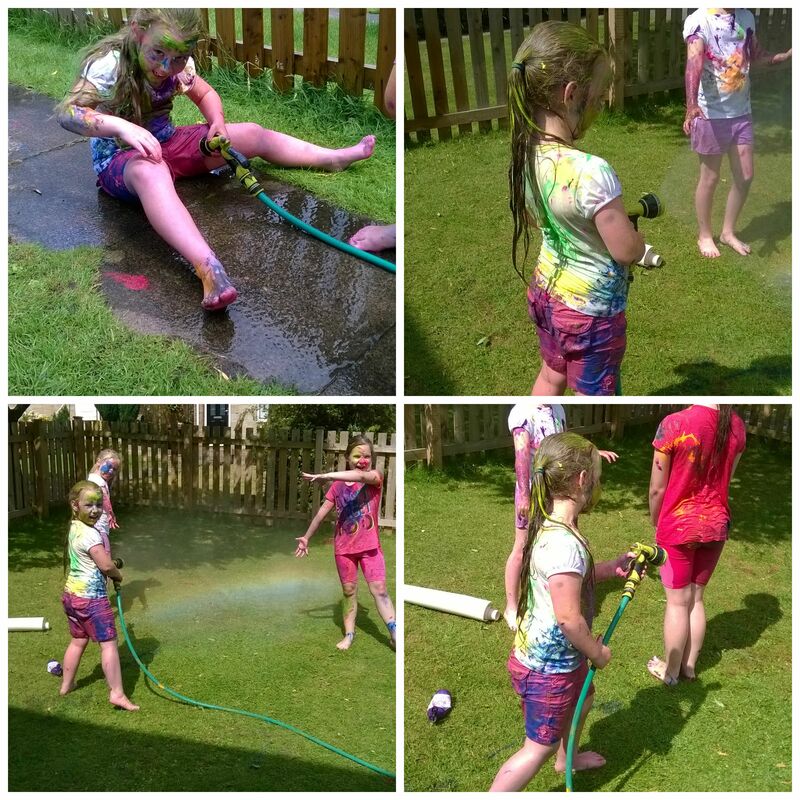 We actually turned it into a really fun activity, big sponges, soapy water and the pressure washer! 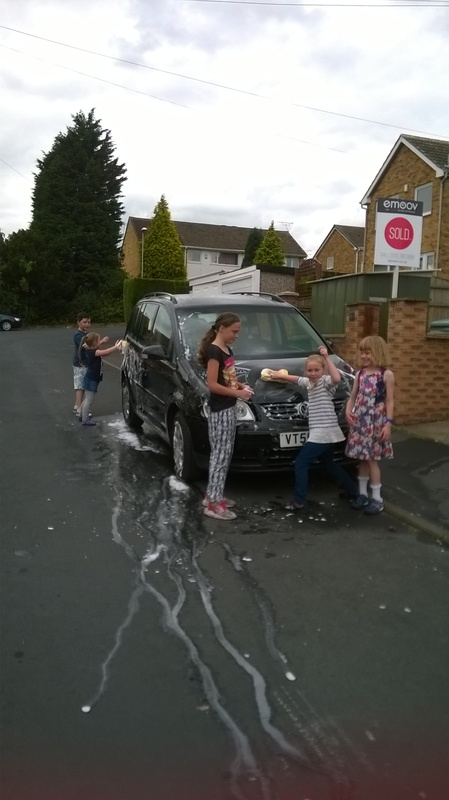 and it got the attention of some of the neighbourhood kids who came to join in too – the car – its the cleanest its ever been I can tell you. 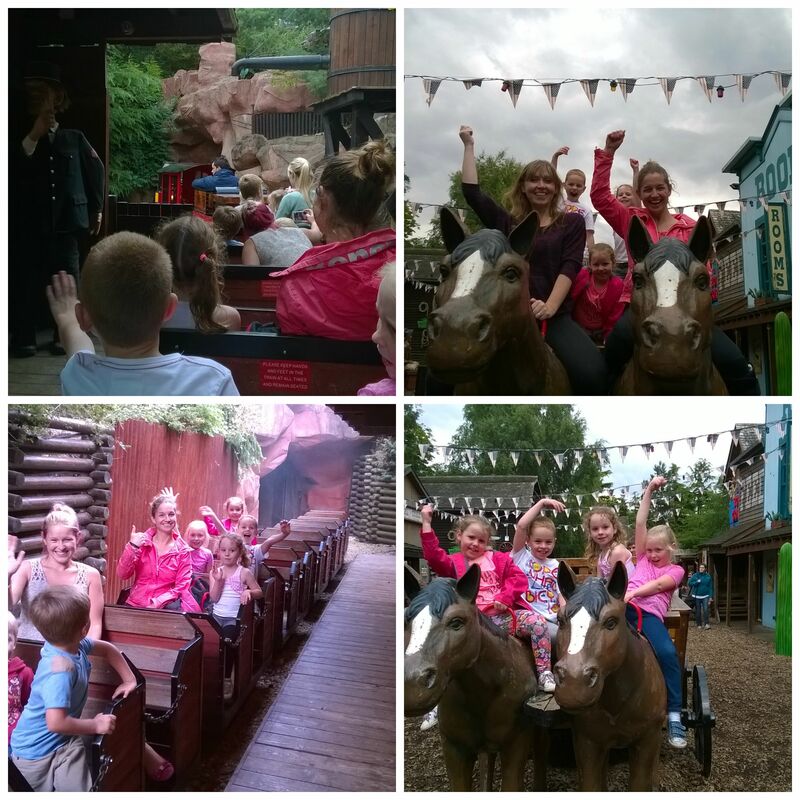 They were proud of their achievement, want to do it again soon (RESULT! ), and to boot they feel like they’ve earnt their pocket money. I’ve seen a few similar sort of blogs doing the rounds, and really enjoy reading them. There’s something about reading random facts, no matter how insignificant about people – gives you a bit of an insight in to who they are. So I thought – deff one to take part in. 1 . What is your dream job? May sound pretty boring, but would love to be a Stay at Home Mum. Of course, I would also like it to be better paid, better hours, more help. But in todays society, it is such a rareity to be able to have the choice to stay at home – nowadays its expected for you to return to work, almost frowned upon or you are seen as a bit weird if you don’t. 2. Who is your favourite singer/ band? Depends on my mood, it can range from Nickleback, to Fleetwood Mac, Pink Floyd to Norah Jones. Love nothing more than dancing around the room to Maroon 5 or singing my heart out to Meatloaf. 3. 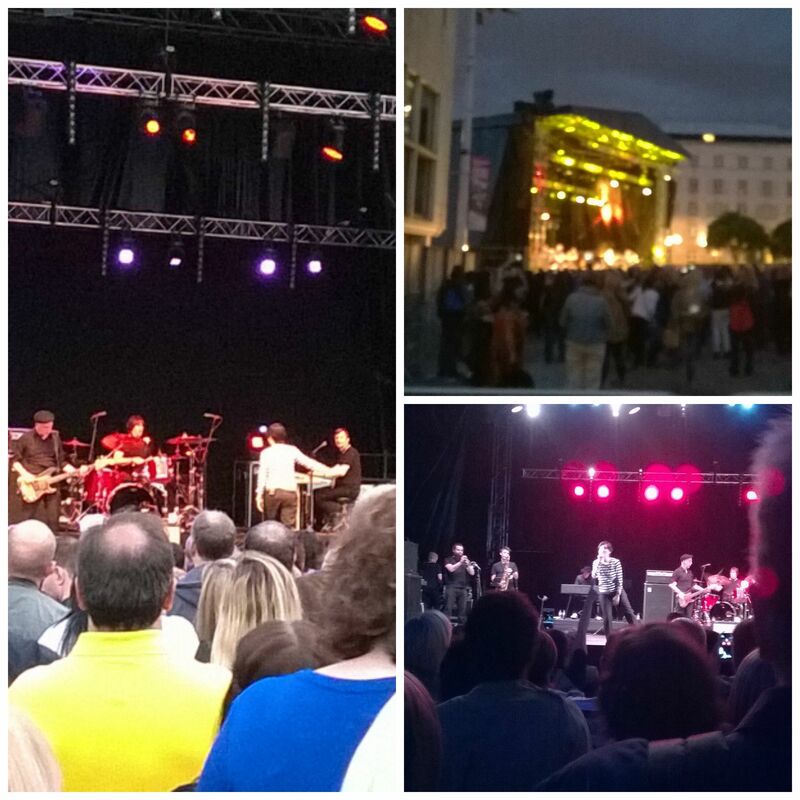 What’s your perfect night out? Anywhere with a dancefloor, music and great company – so that would be hubby or my bezzie mate. Also a good range of Mocktails to choose from would be favourable and a curry before midnight to top it off. 4. What’s your perfect night in? 5. What’s the last thing you bought online? A bikini for my 6yr old from ebay – its August and can I find any swimwear left in the shops ready for our holidays – can I heck! 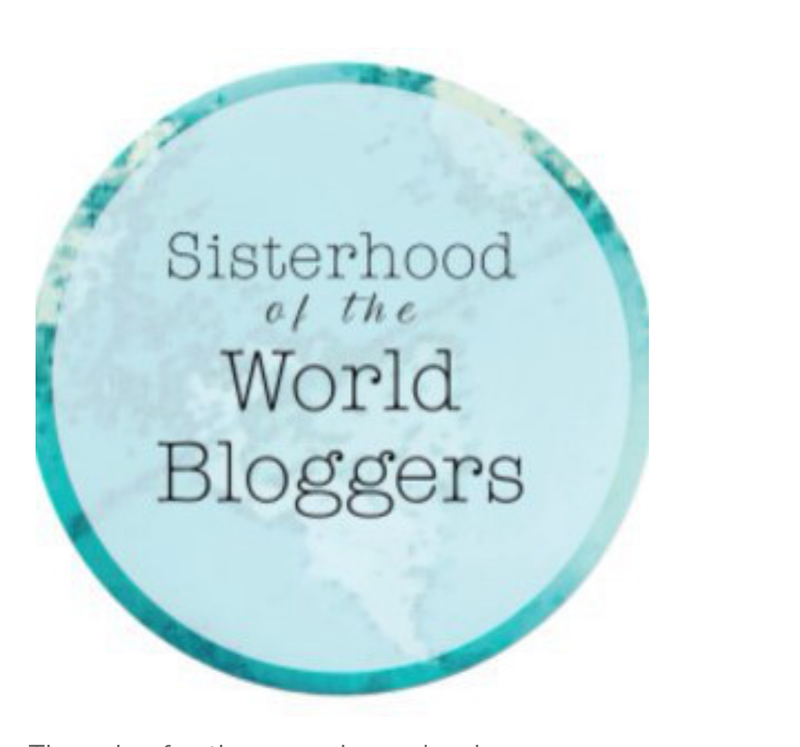 6. Who is your favourite blogger? I wanted to keep a journal of my family life. I kept a written journal from being 14 to 22 and I love to read back over it (often with hot pink cheeks from the embarrasment of what I wrote back then!) Blogging seemed a modern way to do it. 8. Who is the last person you spoke to on the phone? My husband – he tends to text, which is fine for a quick message, but I’d much rather have a real life conversation. 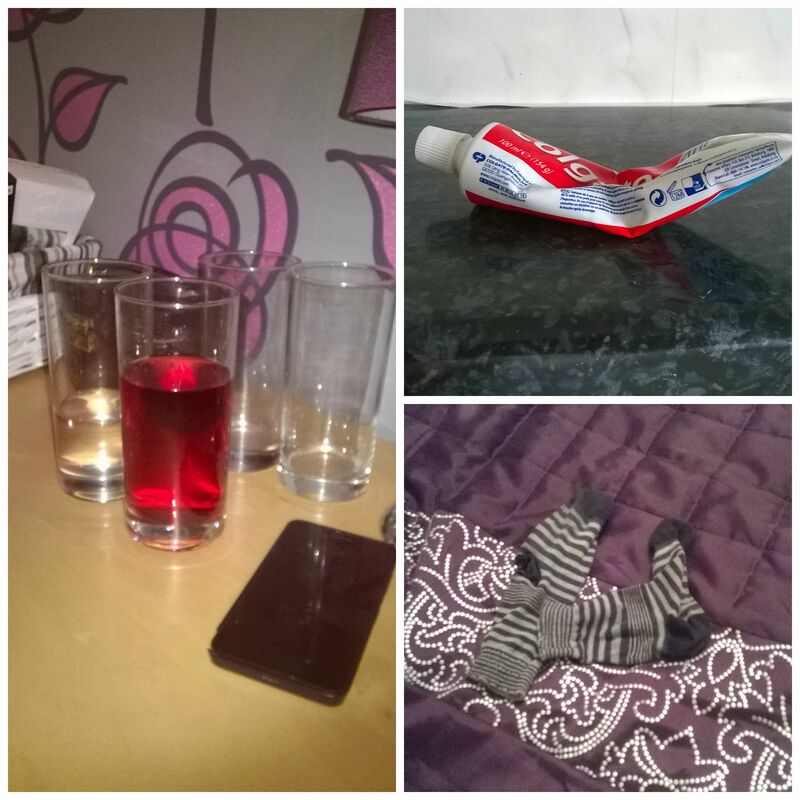 My children – always a source of inspiration (as well as frustration!) Their capacity for love, forgiveness, their desire to learn and create astounds me everyday. As much as they drive me completely and totally insane, I often wish I could be more like them. 10. What is your favourite animal and why? Fat cats. We had a cat called Pudding who sadly at 17yrs old went to the cat basket in the sky last year. In his hay day he was the biggest, fattest, furriest thing you’d ever seen, his purr was like a coo of a pidgeon, he gave the greatest cuddles and was lazy beyond belief. Shoes – flats or heels? What pizza topping would you choose? If you could be a person from history to be, who would it be? What cocktail/mocktail would you order? What was the last thing you took a risk on? Your dream holiday destination, where would you go and with whom? Did you know that August every year is Romance Awareness month. Well I didn’t, not until I came across it on Trista’s (Domestic Momster) blog. Got me thinking – So I’m not a slushy hearts and flowers sort of person. 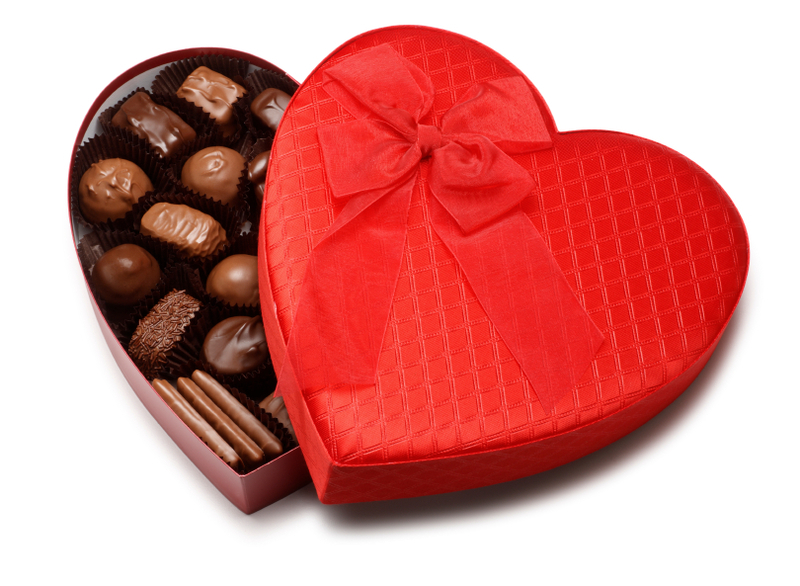 I don’t need or expect big romantic gestures (although chocolates will always go down well no matter what – mentioned just in case Mr D is having a nosey at the blog). 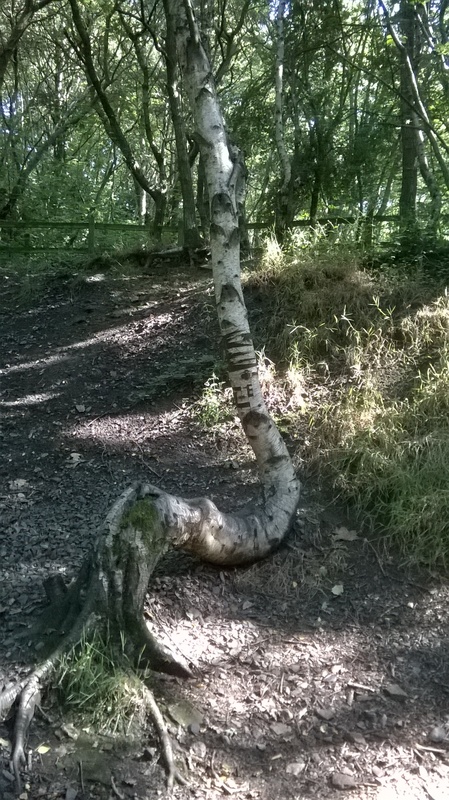 Asked myself a few questions…. Do we make enough effort, time and opportunity for romance? 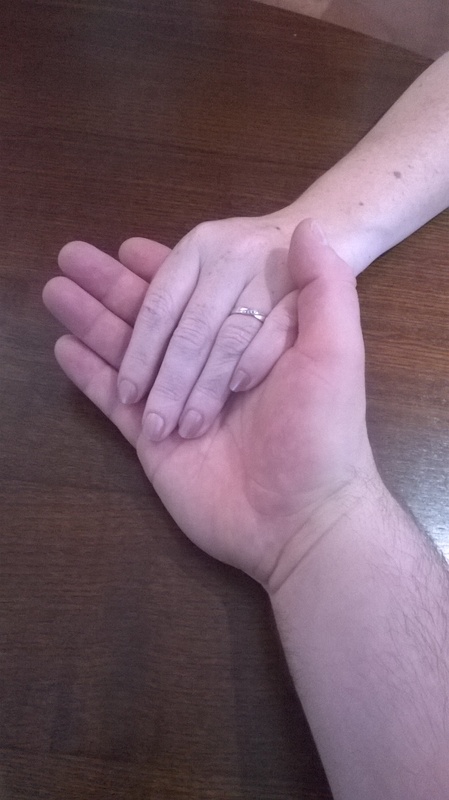 We both do the little everyday stuff which is a general part of our lives together, we hold hands, we cuddle up on the sofa, I love you is said a lot. Those things are part of who we are, the type of couple we are and the relationship we share (nice stuff & niggles detailed in a previous post). Surely all of that is classed as romance. But would I say we go above and beyond these… not on a regular basis. Are we taking our relationship for granted? Are we taking each other for granted? 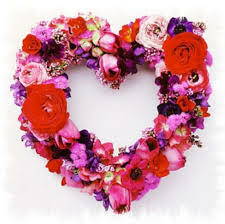 Would a bit of extra ‘Romance Awareness’ now and again go amiss in keeping the fire burning bright in our relationship. Probably not, certainly couldn’t hurt. I am pretty action orientated, bull by the horns so to speak. So with Romance Awareness Month in mind and it being a child free Sunday (they were off at their dads) – a perfect opportunity to inject a bit of ‘romance’ in to the glorious warm day. What could be easier better (am meant to be making an effort, easy shouldn’t come in to it!) than a picnic in the park together. Me, him, picnic blanket – spot on. 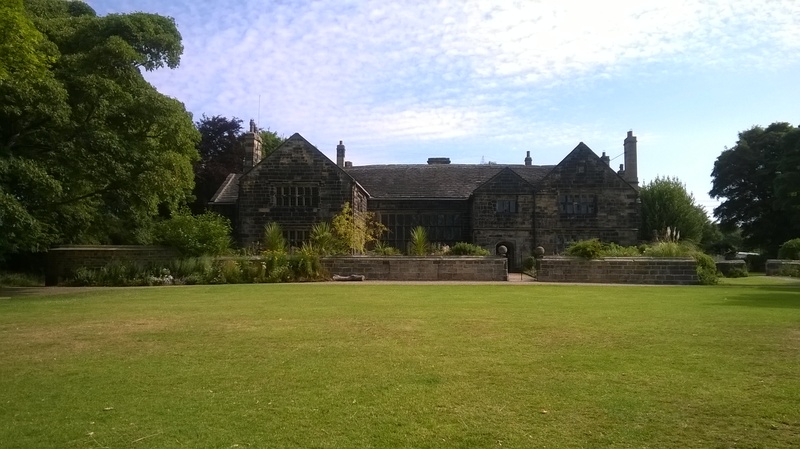 Sunday is Church day, but today, romance was coming first, so left church early, picked up a few bits and put together a couple of his favourite picnic foods – namely tiger bread and cheese, jumped in the car and headed off to Shibden Park. As busy as it was (given its a family friendly place, lots of open grass and the sun was cracking the flags, it was hardly suprising), we found a nice spot, laid out together and watched the world go by. 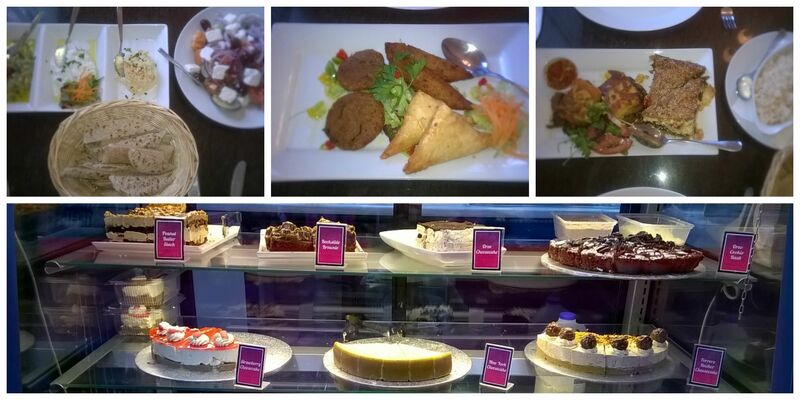 Food, followed by chat, followed by a bit more food, and a lot more chatting. I approached the subject of ‘Romance’ cautiously – expecting to be met with the rolling of eyes and a response of ‘all that fuss and nonsense’, but he was actually quite receptive. 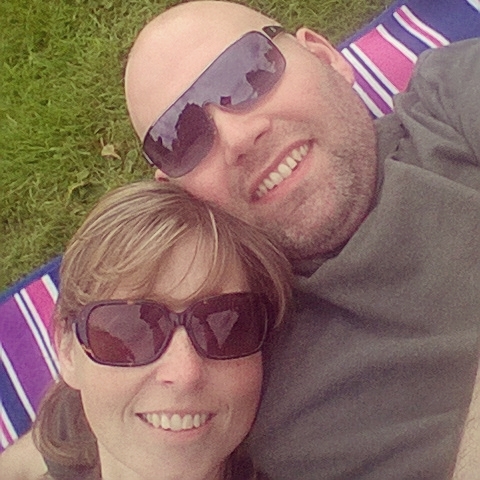 Especially as I put to him we could have a little romance competition for the month, see who can get in the most ‘random acts of romance’ before the end of August – my dear husband is THE MOST competitive person I know (well, him and his brother!).. so this was pretty much a sure way of getting him involved. But we’ll see, as we know the saying and the doing are totally different things! I also said we could have a prize for the most inventive gesture – that should be interesting. 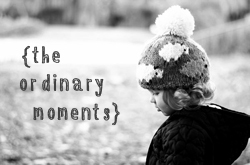 Over the next 3 weeks I’m going to update on our ‘randmom acts of romance’ – lets see where it takes us. Sick buckets may well be needed – pre-warning issued. 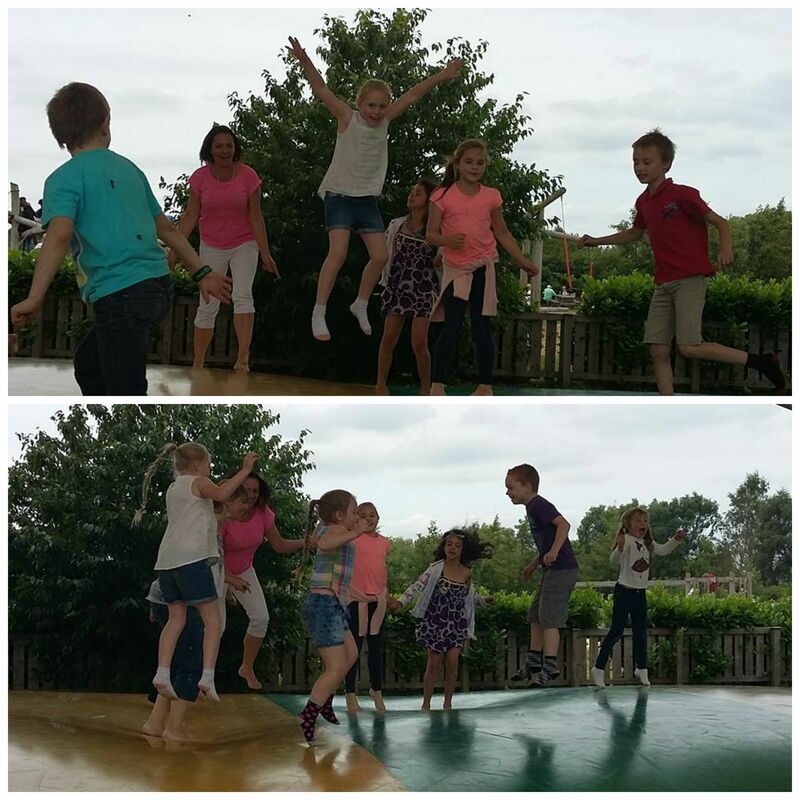 Half way through the holidays – where is the summer going. I’m so concious that the weeks are slipping away I am trying to get so much in. 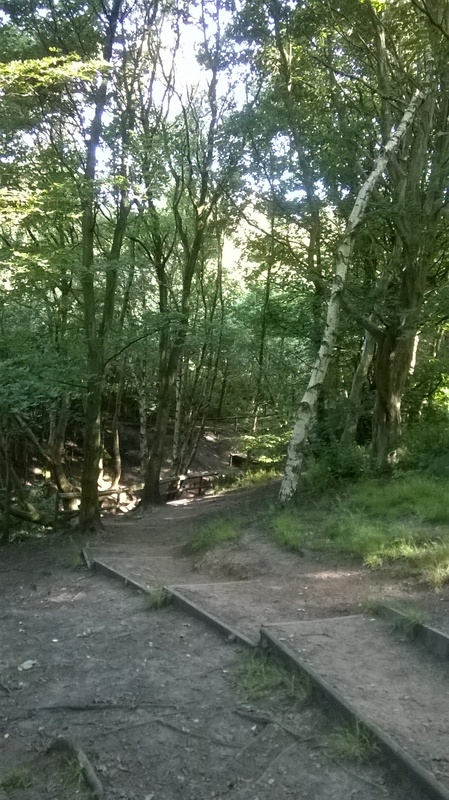 An early morning brekkie treat with Ron at the local Harvesters followed by a lovely walk around Oakwell Hall to work it off. Was a perfect start to the day. 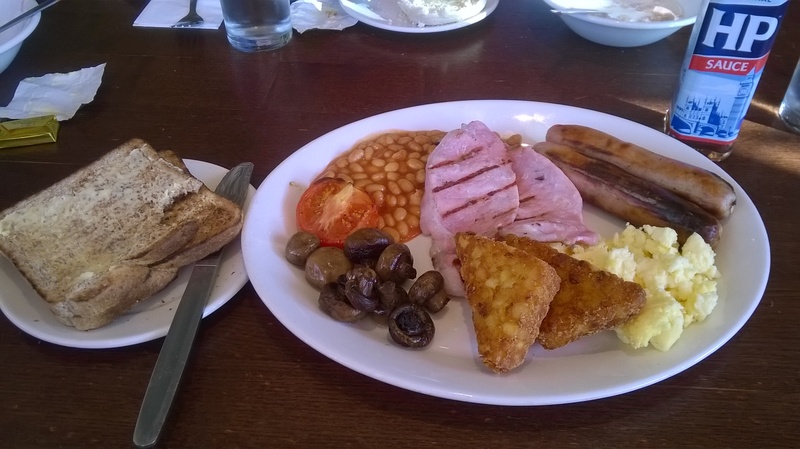 Breakfast was amazing, not only in amount and quality, but cost too – at only £4.99 for unlimited continental option and then full English – can’t go wrong and it may turn in to a bit of a regular weekend outing. Birthday – uneventful which is the way I like them. 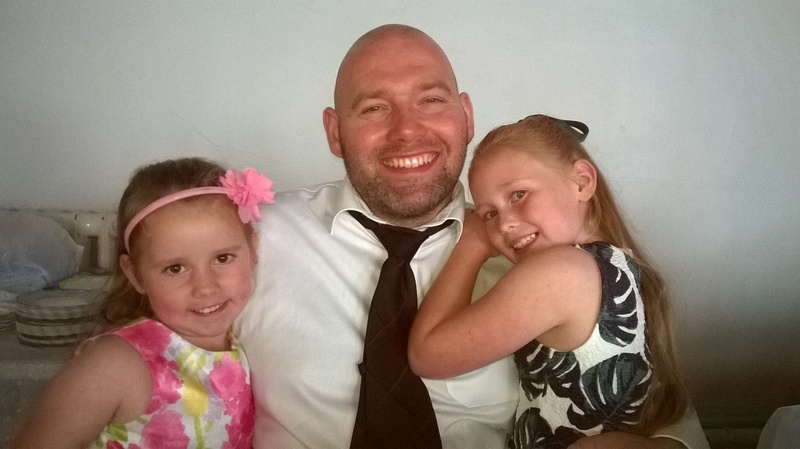 Birthday – 42yrs old – I’ve never really been able to come to terms with getting older. I remember turning 10, and being devastated that I would never be single figures again. 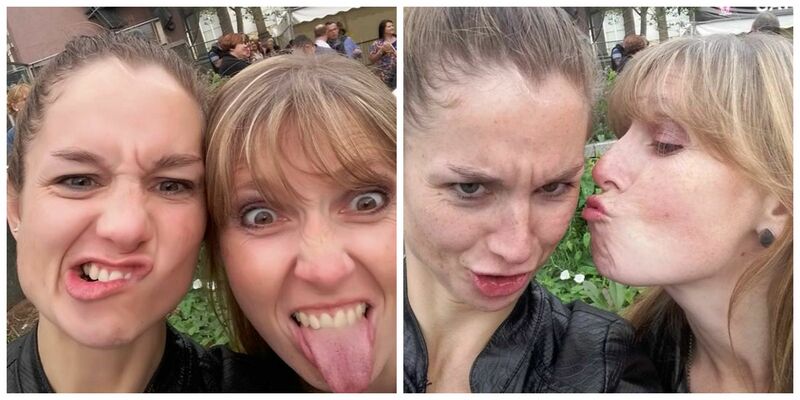 Turning 30 was a nightmare, I was traumatised for days! 40 was more manageable, helped by a weekend away with Ron (we were newly dating at that time), Now I’m just doing my best to ignore them. Girls being at their dads. Its a bit of a double edged sword. Having a break is great. Having couple only time with Ron is fantastic and not to be taken for granted EVER – but I really really miss them when they’re not here. 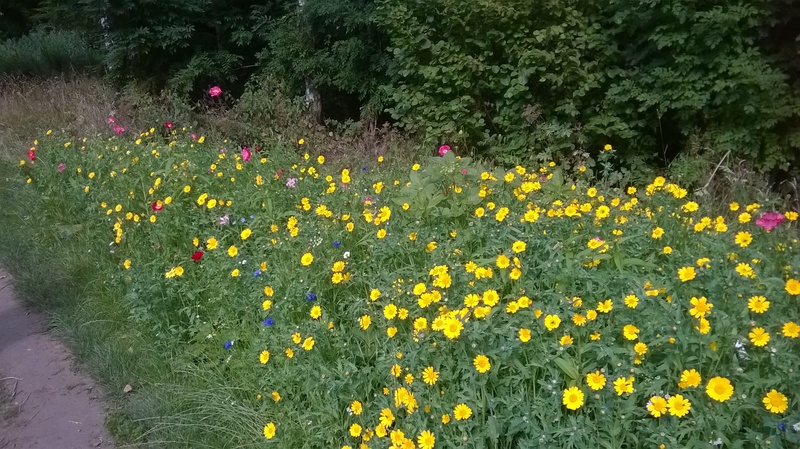 Got all the practical jobs done on Saturday afternoon – lawn mowed, survived supermarket shop. Actually gave Aldi a try this week – everyone saying how much they save gave me a bit of a push. I wasn’t disappointed, must admit, spent less than I usually would. Washing done (and the makings of Mount Everest aka the ironing pile has started again), – might be mundane but still get a sense of satisfaction when its all done. Attended the last of the summer weddings – congratulations to Nicola & Zak – finally tying the knot after 10 years together. 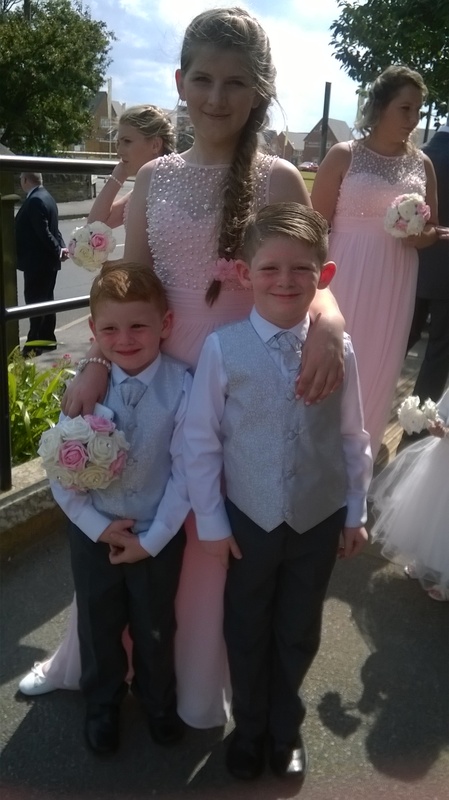 Her dress was stunning, and Nicola’s three kiddies were adorable. Natalie danced non stop at the evening do – she’s her mothers daughter afterall, she certainly has all my moves and more! 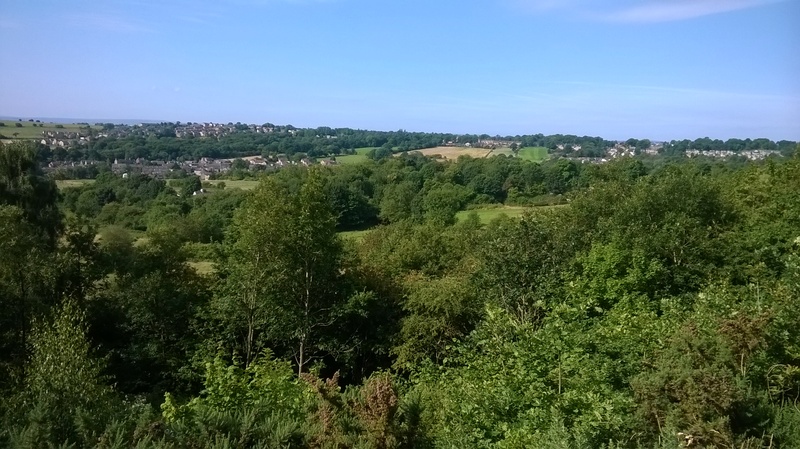 All the wonderful local beauty spots we have around here. We are so lucky to have so many amazing places on our doorstep where we can enjoy green open spaces, woodland walks, wildflower meadows. Great to enjoy as a couple and explore as a family. I am not a naturally creative person. Doing crafting, baking, and the general making stuff activities with the kids for me takes a lot of effort. But they love it, so I do make the effort despite my OCD tendencies to take over what ever it is they are doing .. I find myself getting overly involved wanting to ‘help a little’ (ok.. a lot!) if they are not doing it quite right, or exactly how I think it should be done. I would probably be better off tying my hands behind my back during these type of activities to stop myself interfering and let them just get on with it. I’ve really been noticing this week that whilst I am not particularly creative, actually my children are. One of the activities on their Summer Bored Board click here see prev blog post to read more about the Bored Board– (SERIOUSLY – introducing the Bored Board these holidays is one of the best things I’ve ever done!) is to ‘write a story’ – Jess has been loving this. She talks through the concept of the story first, writes a title and introduction before beginning her narrative. Pictures always accompany the story and she never forgets to credit herself on the cover as the Story Author and Illustrator! She finds so much to spark her imagination, creating delightful characters going on different adventures. 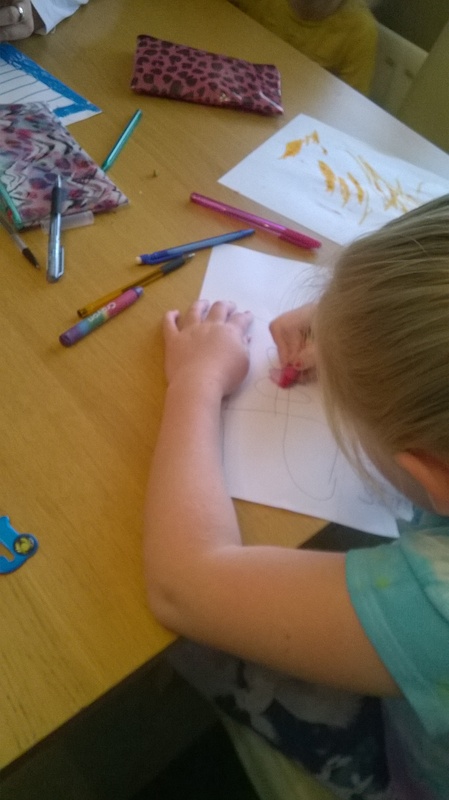 i know its important to encourage creativity where you can, but I’ll be honest I find it hard work – I’m all for the self entertainment sort of stuff (writing their own stories, drawing pictures etc), the larger projects – painting, model making, baking – any really messy stuff I’m not so keen on. Setting it all up, covering everything that is in danger of being glued, painted on or covered in gunk for what seems a very short amount of playtime before I find myself deserted as they’ve gone off to do something else and I’m up to my elbows is mess! But this week, I decided to grasp the nettle so to speak. 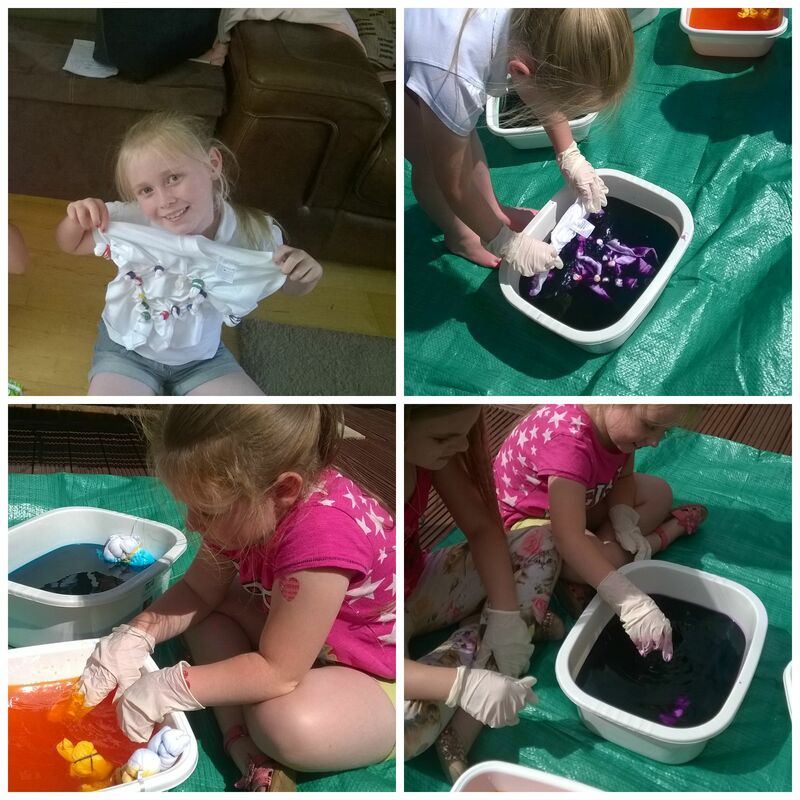 One of their ‘Bucket List’ activities was to do some tie dying of t-shirts. A definite outside activity, and with Monday being a dry, occasionally sunny day it was the perfect opportunity. 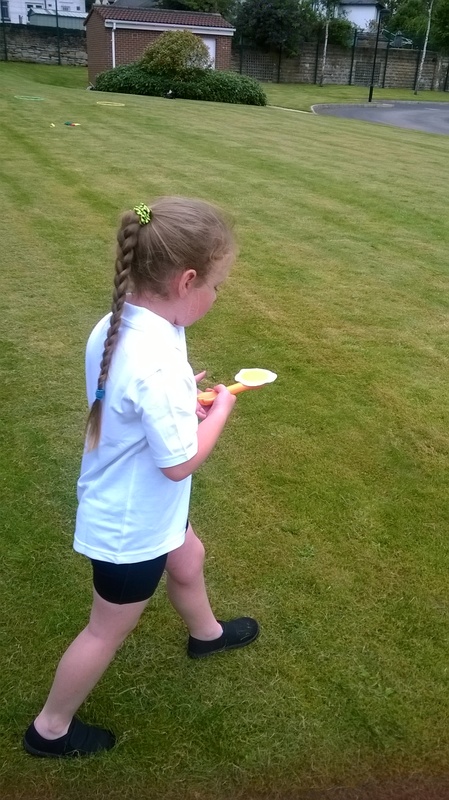 A quick google on instructions – came across parents.com (click here), a dash to Wilkinsons for the dye, salt and cheap washing up bowls, Dug out their P.E t-shirts from the last term of school and off we went. It was such a pleasure to watch them coming up with their designs, deciding on colours and how they wanted them to look. They showed patience in waiting for the dye to work and were so excited when it was time to take them out and see how their designs had turned out. They even offered a critique on the patterns, and decided what they would do differently with the next t-shirt. They enjoyed it so much I ended up opening up the new t-shirts for the next term of school and letting them dye those as well. 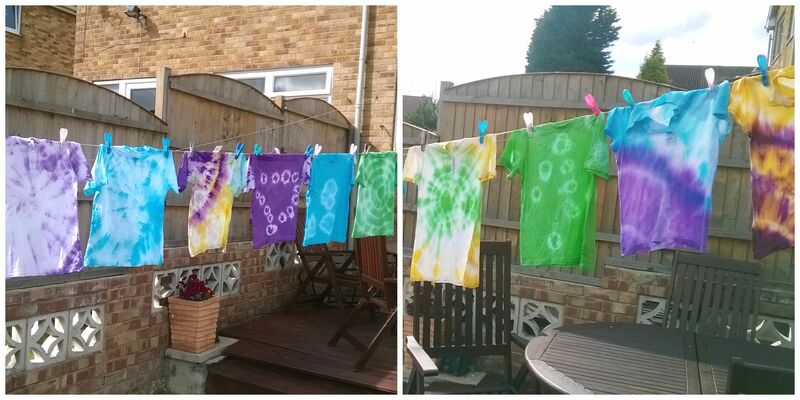 Safe to say, we have enough tie dyed t-shirts to get them through the whole of the summer! The aftermath and clean up wasn’t too bad either, and seeing their creativity, personal style, originality and imagination really come through was well worth it. 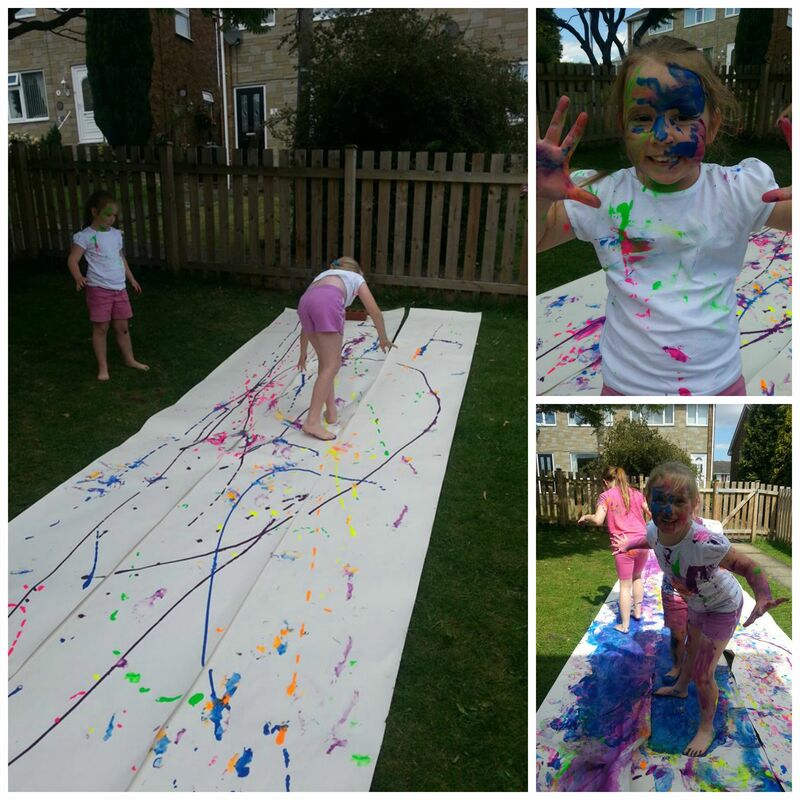 After such a successful and relatively stress free activity, later in the week we really decided to push the boat out on the messy play front – and went the whole hog with ‘Paint Wars’ . 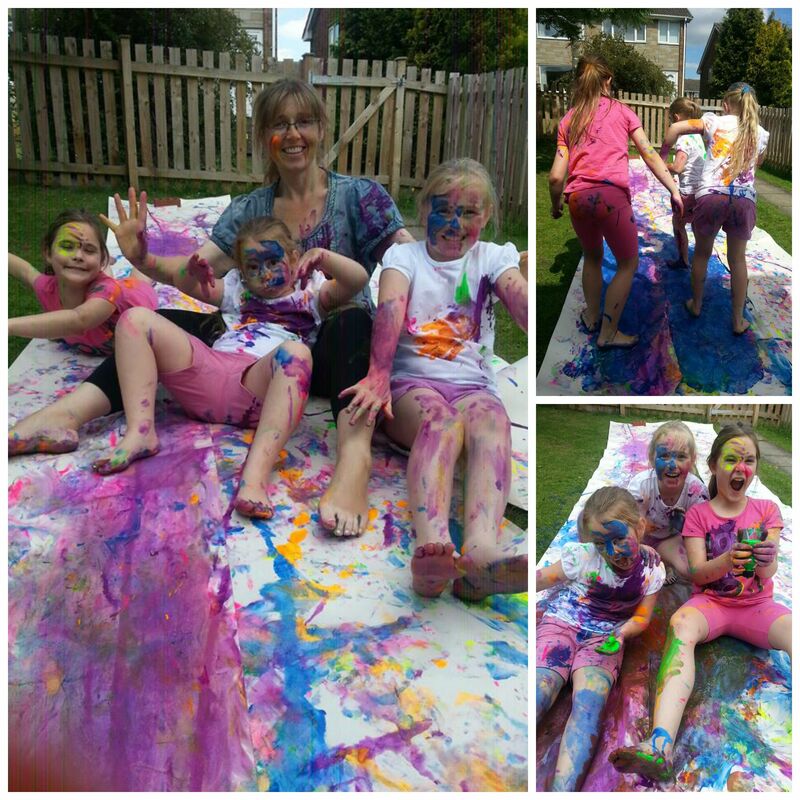 This amounted pretty much to covering the front garden in lining paper, squirting a load of paint all over it, and letting the kids (ok.. and me too) slip, slide, run through, roll in and get throughly covered in paint. 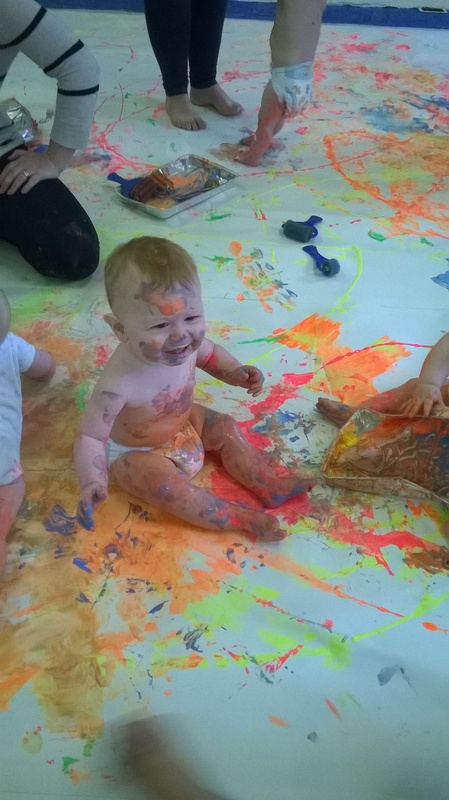 Of course, it descended in to not only squirting the paper with paint, but then each other! A quick clear away of the paper, and it was out with the garden hose. There was no way anyone was entering the house until at least the majority had been washed away. The water hose brought a whole other dimension to our play time, being chased round the garden by my 8yr old squeeling (the squeeling was me, not her!) jumping through the spray and their total awe when they made rainbows appear through the mist was pretty magical. It was such a sense of freedom, play without limits, so much laughter, the biggest smiles ever, cheekiest of giggles, screams of excitement. Truly what sunny, summer days should be made of. 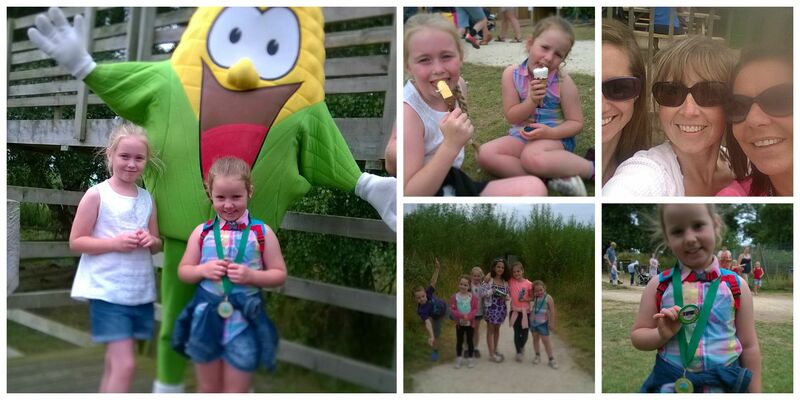 Half way through the summer holidays already! I remember as a child the signal that we were midway in to the holiday was the sudden appearance of all things ‘Back to School’ in the shops. Uniforms, school bags, lunch boxes, stationary etc. As a kid I hated seeing it all as it meant that all too soon it would be back to early mornings, homework, and dark, cold evenings. Nowadays though, ‘Back to School’ stuff appears in the shops pretty much immediately! 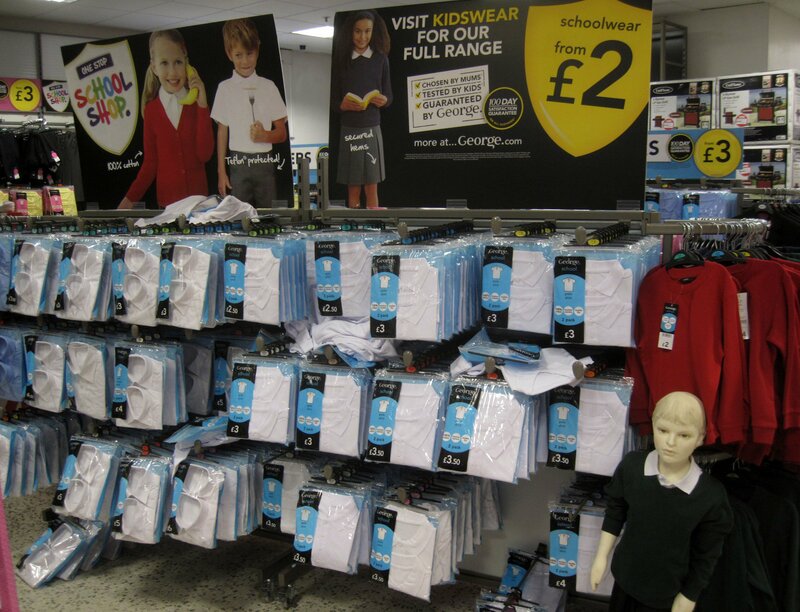 In fact the new uniforms were in the entrance to Asda before schools had even broken up for the holidays! Really, the only tradition we have done each year is around the purchase of new stuff for the new term – and thats just because its an essential activity, rather than a tradition as such. Historically I’ve done this the the last week of the summer holidays – but I found last year that I’d gone to do the whole back to school shop and there was almost nothing left. Getting jumpers in the right colour was a nightmare, the choice of pinafores and skirts non existent and the queues at Clarkes for new shoes was interminable. To not get caught out this year – we are starting early. However, I absolutely, categorically refuse to start any earlier that week 4 of the holidays. It just doesn’t seem right or fair to be thinking and focussing on the end of the holidays when it feels they’ve not long begun. But also this year, I thought we’d start a couple of new traditions. As much as the summer holidays are great, its awful that the last couple of weeks of them, and certainly the few days are plagued with that feeling of dread (for both me and the kids to be honest) that the holidays are ending and the return to school is looming. Something that I read on a blog The Larson Lingo that one of their traditions was to have a theme for their school year – things like ‘Grow’, ‘Love’, ‘Be Brave’. It was the Be Brave one that caught me. This is going to be a big year for Jess and Nat. The move of house, new school, new friends, new routines. All major changes. They really are going to have to be brave, show courage and determination. So, we are going to take on the tradition of an annual theme and introduce it through a Last Supper of Summer. A special dinner on the last day of the holidays. 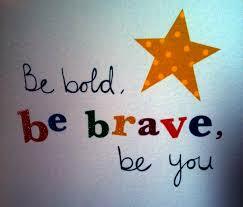 Theme – we deffo have to go with ‘Be Brave’ – I’m working through ideas, will include them, and update on a future blog. One of their concerns each year of returning to school is having a new teacher. They have spent a whole year getting to know the last one. They have built a bond with their teacher, they know what they expect, how they will react, and will rightly so miss them a great deal. Then all of a sudden they’ve to start all over again. 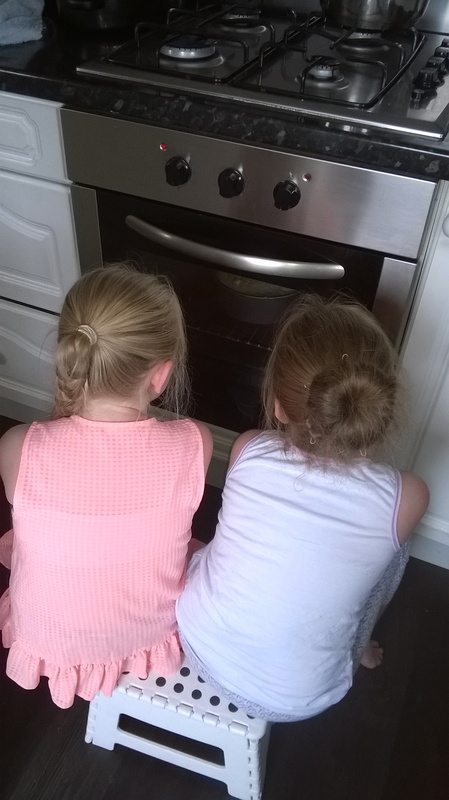 For both the children its something they have talked about regularly and I feel that its what causes them the most anxiety when thinking about starting the new school term. Yet another good idea on The Larson Lingo blog which I’m going to adopt and adapt was ‘My favourite things’ questionnaire. 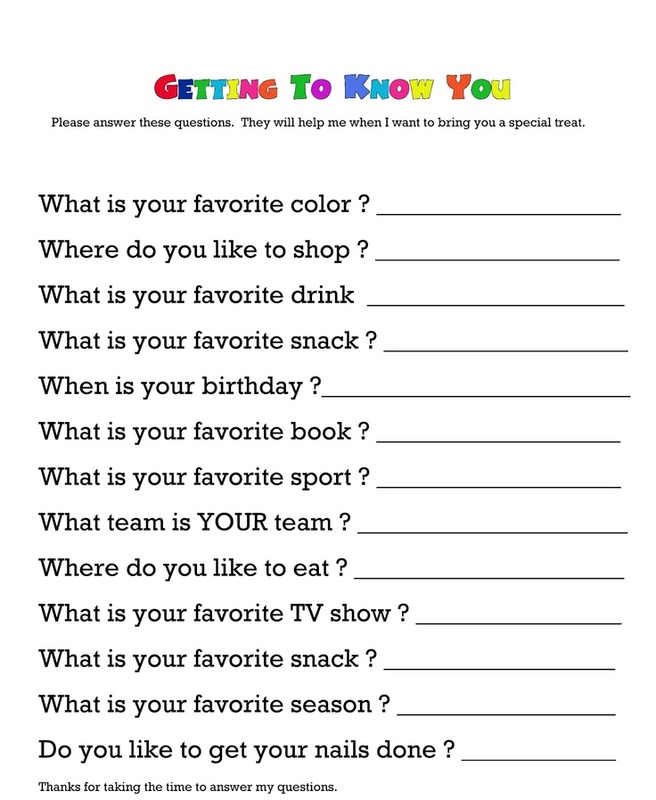 A list of simple questions they give to their teacher to answer along with a gift to help them get to know her. I think this is a wonderful idea. A little gift for the teacher at the end of their first week to show a bit of appreciation (I do admire teachers, and I can imagine that the first week back for them is a total nightmare). And what a great way for the kids to get to know their teacher, feel more comfortable around them and start a strong teacher pupil relationship. I’m adapting it a bit as I’m going to get the girls to fill our their own questionnaire to give to their teacher with the small gift so the teacher can know some things about them and one for the teacher to then complete and return back to the girls. 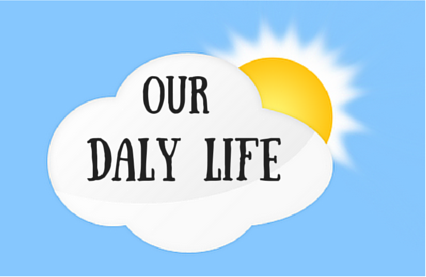 So, 3 new Back to School traditions in our ‘Daly Life’ – can’t wait! Blending together as a family is one thing, blending together as a couple is another matter entirely. Its almost unheard of nowadays for couples not to have lived together before they get married, we however didn’t do the the try before you buy scenario. Not only did not live together before we married, but haven’t done since we married either. That is set to change in the next couple of months, and its brought to my mind recently on how I’m going to manage the transition from being a married yet singleton so to speak, to being real life couple and all that it brings with it. I’ve lived on my own for 4 1/2 years (with the kids of course). I’m a bit set in my ways, used to ruling the roost, making my own decisions, getting my own way pretty much all of the time (except when the kids pester power gets the better of me). Mr Daly is here only a couple of days a week, and as such has little impact on the way I go about everyday life, but there are the odd couple of things that I’ve had to take note of, little reminders along the way that he has his own way of doing things, his own foibles and little quirks. 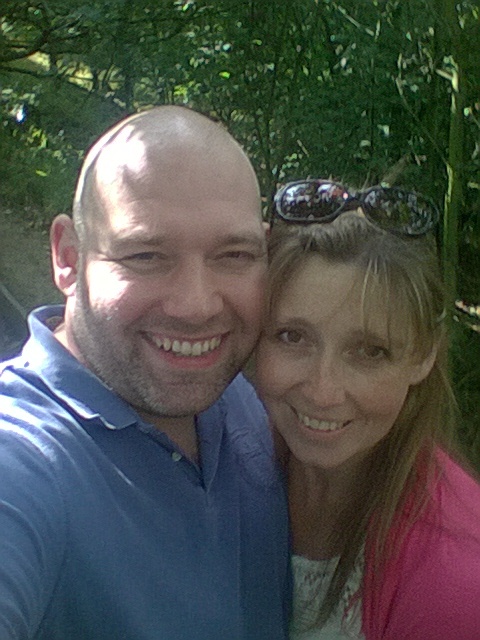 Blending together as a couple has meant embracing the good and the bad, the odd compromise here and there, keeping a balanced and honest view of our relationship – recognising the positives and keeping them at the forefront of the relationship and accepting that there will always be a few negatives. No one is perfect, perfection would afterall I think get boring anyway. However, it can be so so easy to take the good bits for granted and let the little, insignificant annoyances fester. He is always the first to ask me how my day has gone. What I’ve been up to, how have the kids been. Despite him working very long hours, often being very tired and usually arriving at mine pretty late in the evening, he always puts first my need to off load my day. Only after I’ve rattled off everything I’ve been up to, do I take a breath, and remember – his turn. Then, there are the niggles – small, insignificant things, but as insignificant as they are, they haven’t gone unnoticed! 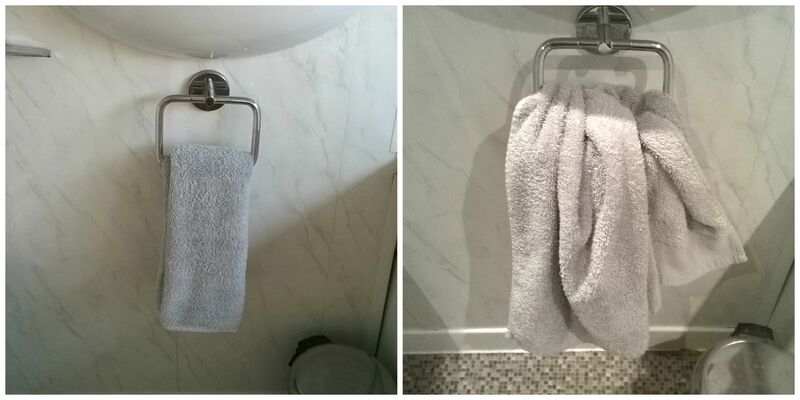 But you know what, even though I give a bit of a mental ‘tut’ when I am re-folding the towel again, or a resigned sigh as I squeeze the toothpaste from the bottom of the tube back up to the top. I also have an inward smile, a bit of a warm feeling. Because as tiny and unimportant as these niggly things are, I’m grateful for them. When I pick up his stocks from the bottom of the stairs and throw them in the washing basket, it reminds me that he’s here, and due to the way we currently live, thats a bonus as the majority of the time he’s not. I recognise the fact that I am most definitely, without doubt not an easy person to live with or even be around sometimes. I would hate to see his list of niggles about me – endless is a description that springs to mind! Quite often my stress levels are off the scale for which unfortunately my family bare the brunt of – but he accepts this, without question, with patience and understanding (and lots of hugs). This is what I mean by me trying to keep a balanced view of our relationship – keeping and remembering constantly of what is good, what is really of value in our relationship, my husbands true worth rather than any of the occasional trivial annoyances I come across. Blending together is a process for me that has and is taking time, patience (hmm.. need to work on that.. not my greatest attribute), and love (we’ve got plenty of that thankfully). I am having to learn that I am not the centre of my world , we both are. That means working together, seeing, understanding and sometimes accepting (only sometimes mind!) an opposing opinion. I learn a lot from him – mainly a better way to deal with stuff other that screaming my head off, and I do try (not always successfully I admit). Blending together has wanted to make me a better person, better mother, better wife (again, not always successfully, ha ha…but I’m trying) And isn’t that the ultimate goal – to become better and happier people together than you were apart – I hope so, thats certainly where I want to head. Week 2 of the holidays and a bit of a jam packed week. Many more highs than lows, many more goods than bads – so I’d say a pretty productive, fun, family week. 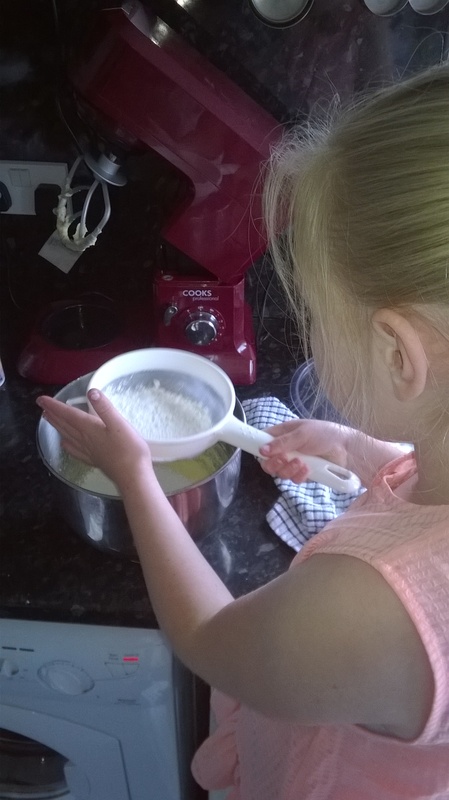 High – successfully managing to bake a cake! With much help from the girls, a never fail recipe supplied from a friend, more buttercream than you’ve ever seen before – ta dah! 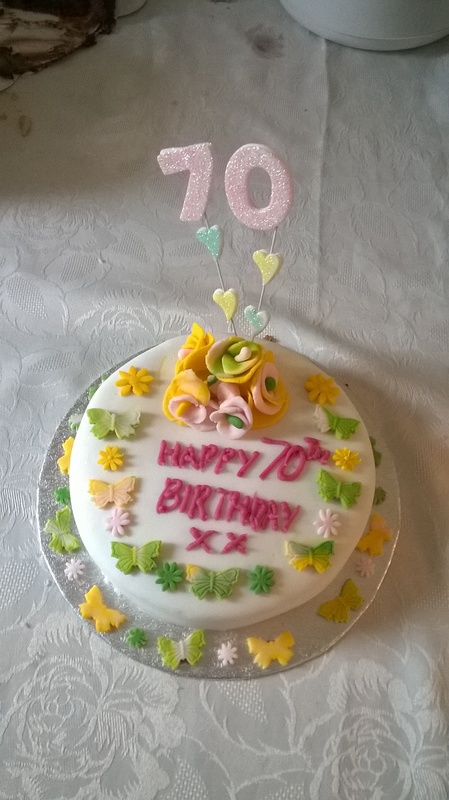 An edible, half decent looking birthday cake for my mums 70th. 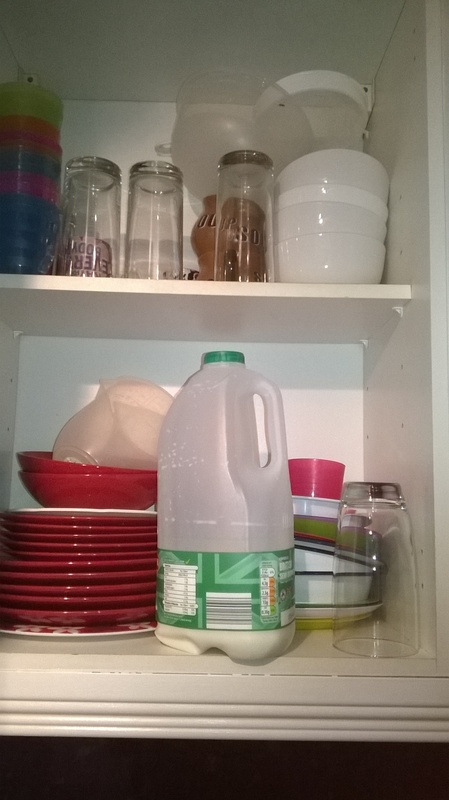 Bad – Currently in mid-bout of insomnia – leading to finding the milk in a a cupboard rather than the fridge, searching for and eventually finding my car keys in the shoebox, leaving house in slippers (twice! ), leaving house without kids.. 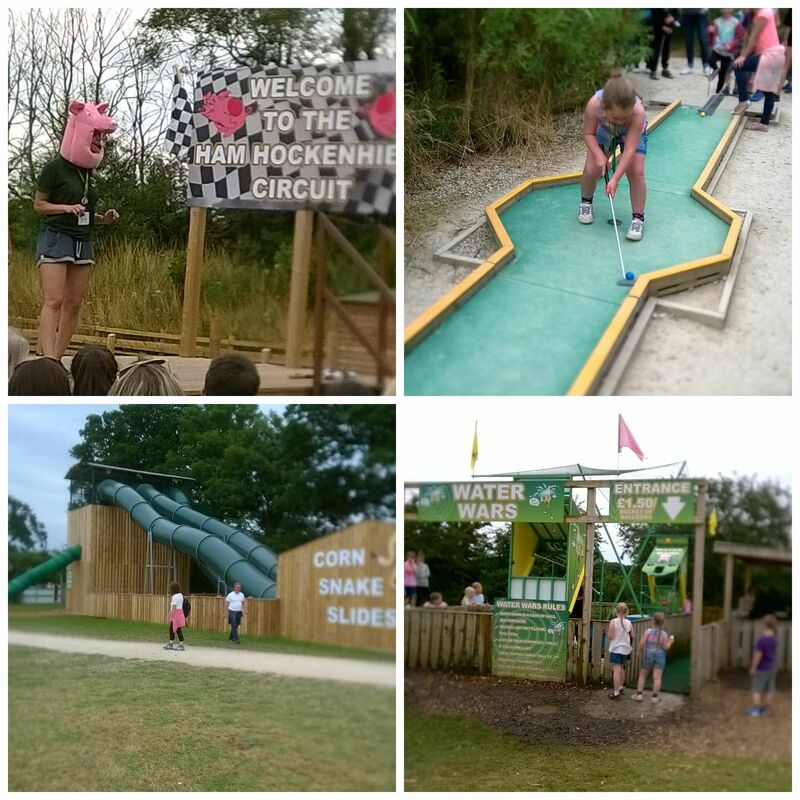 Enjoyed – Loads of fun with the kids this week – from baking the cake, swimming followed by the obligatory cheesy chips in the cafe. A day out at Sundown Adventureland with friends. We managed a lazy Friday morning before heading off to a kids ‘Breeze’ event in the park for FREE put on by the local council. 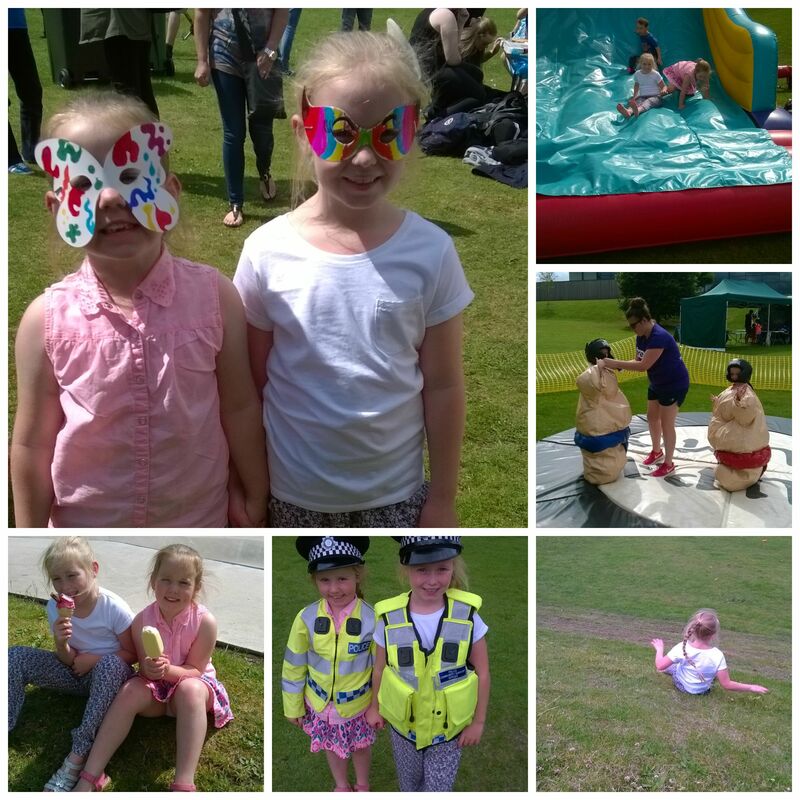 Great afternoon making masks, bouncy castles, dress up, icecreams, roly polys down the hill and especially loved watching the kids put on Sumo suits and try to wrestle – hilarious! 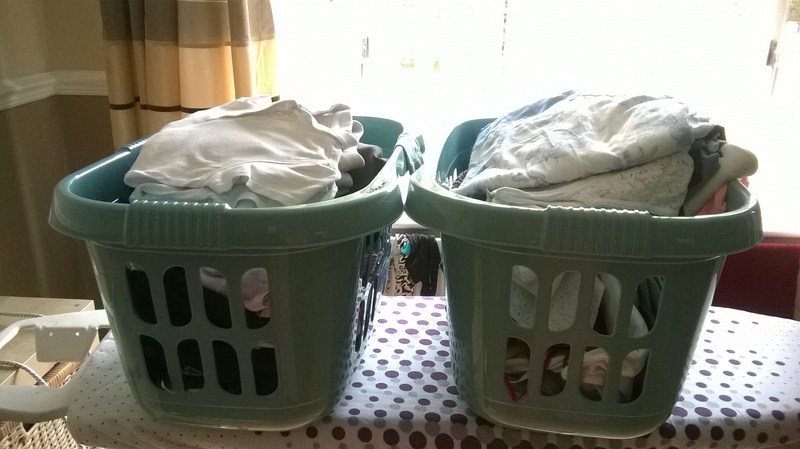 Mundane – finally finished climbing Mount Everest – otherwise known as the ironing pile! Something I’d put off everyday for almost 2 weeks, so you can imagine the size of it. The kids are going through clothes like there’s no tomorrow – they don’t seem to able to keep even just one item clean enough to wear for a second day. 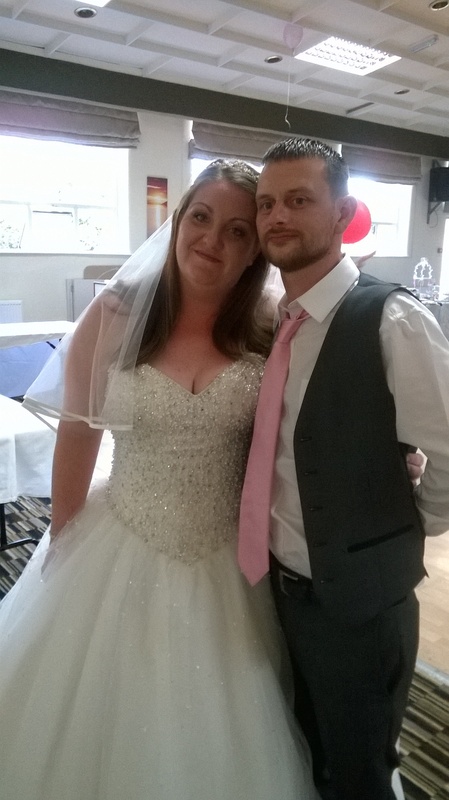 We also attended the lovely wedding of friends – John and Sarah, and they did the Christening of their youngest daughter Isabelle at the same time. Loved the reception. The tables all decorated in a shabby chic style, hession table runners, jam jars with fresh flowers and vintage style tea-cups and paper plates. 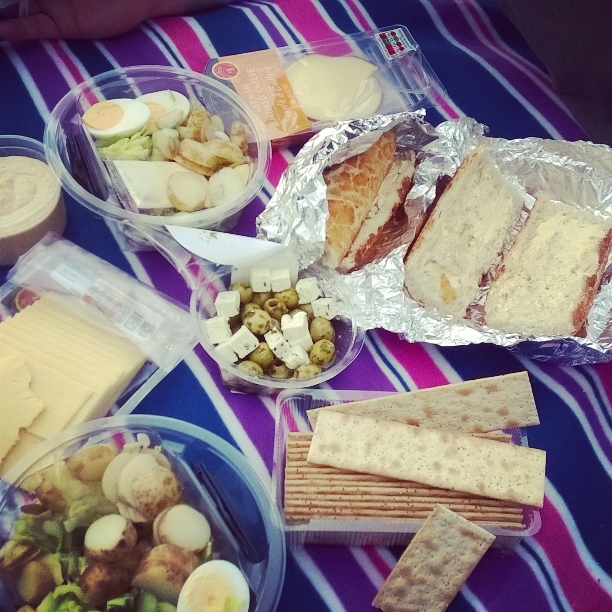 Food was picnic boxes filled with delights of pork pies (best I’ve ever had), fresh bread, cheese, pickles, crackers, coleslaw and salads. Desert was a table filled with homemade cakes – coffee & walnut, strawberry and cream, bannofee pie, scones, chocolate cake – it was a help yourself kind of deal.. so would’ve been rude not to try a bit of a few! 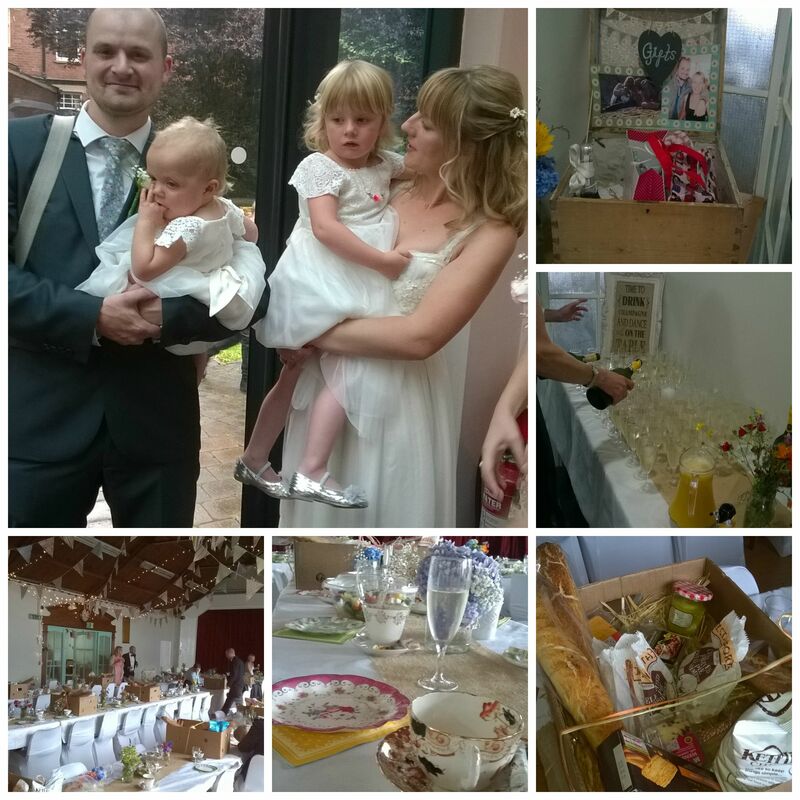 Was such a wonderful, social and relaxed way to have a wedding reception. 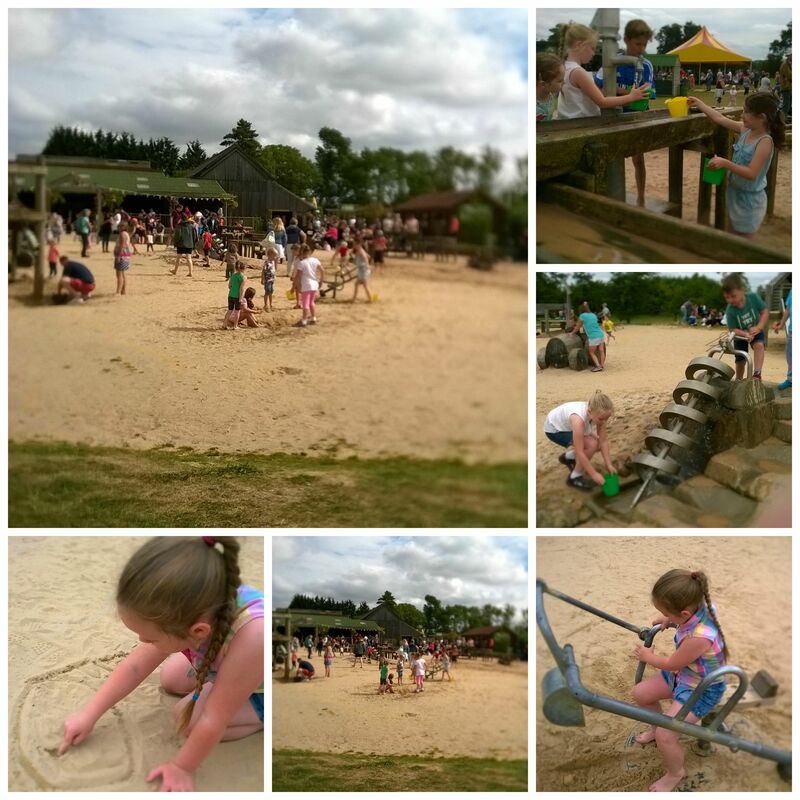 Loads of kids entertainment, bouncy castle, soft play, picnic blankets out for them – fabulous. And the sun even made a re-appearance early evening. It was a beautiful wedding. 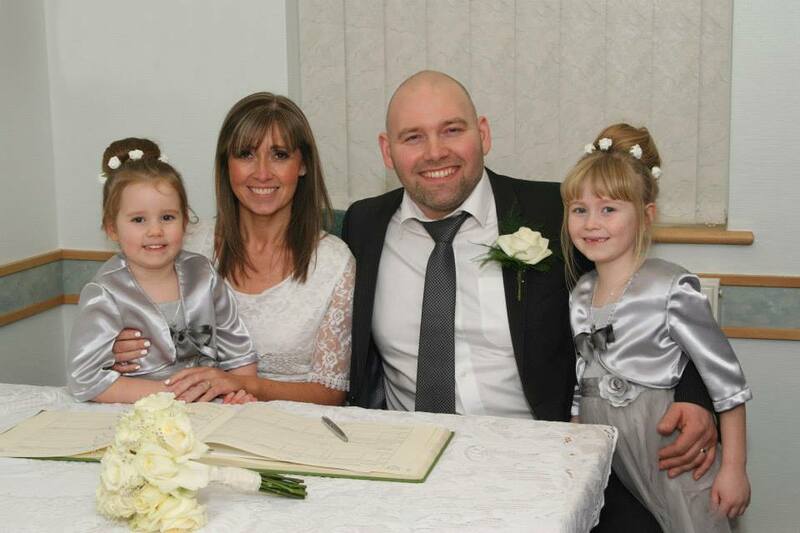 It was also really great to attend as a family and the girls were the best behaved little angels for the full day. They were polite, they self entertained (with the help of a couple of activity books I’d taken along to get them through the ceremony), no arguing, happy to talk and answer grownups with their simple child endearing conversation when required – lots of fuzzy’s awarded for their chart at the end of the day. 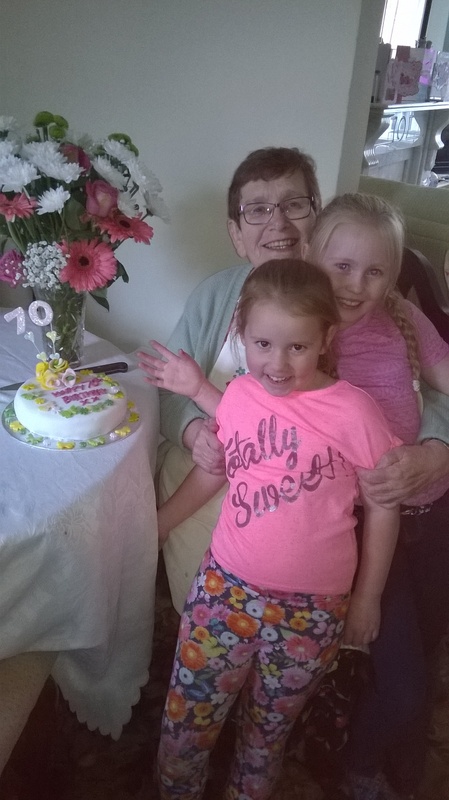 My mum has a bit of a landmark birthday this week – the big 70. 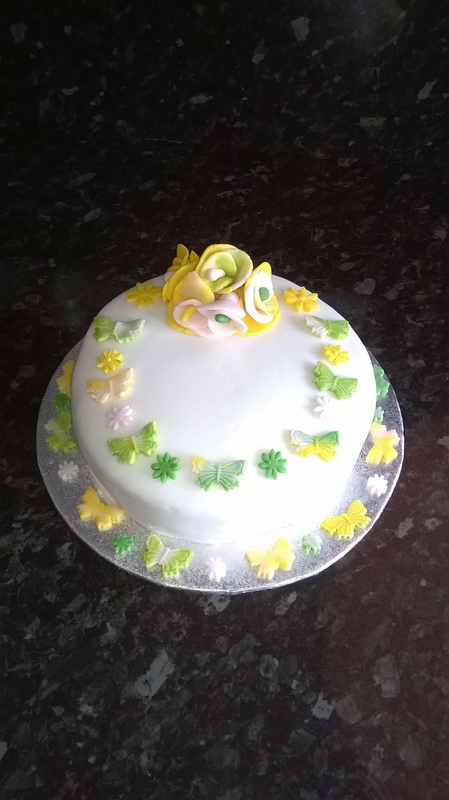 Normally for birthdays I get cakes made, I have a fab friend who has a real talent and does it as a hobby (although I think she should make it her career) or I use Paula at The Perfect Cake Company – who I have to say is the most amazing cake decorator. 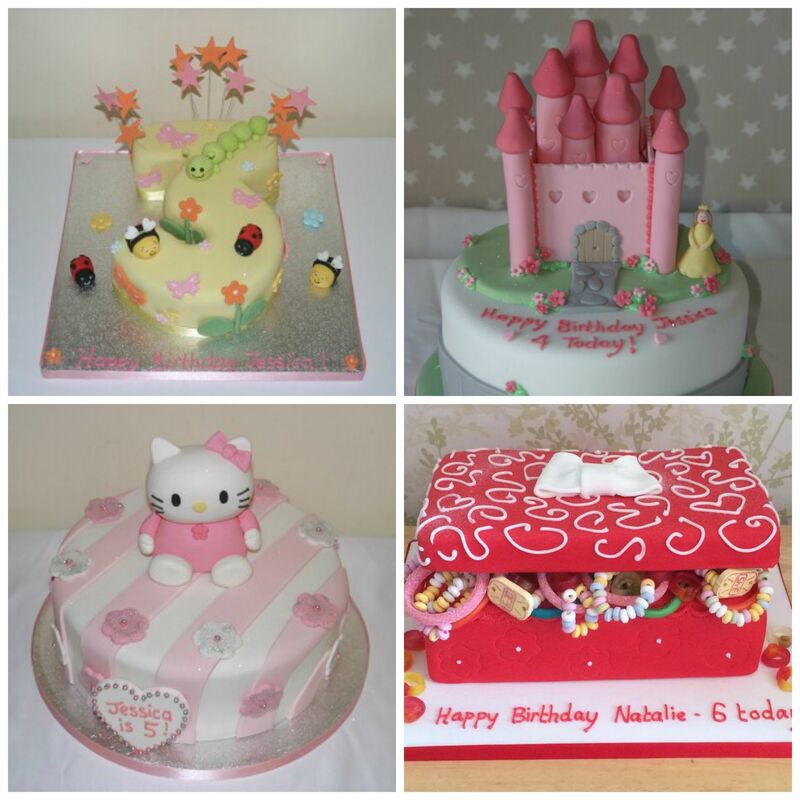 She has done numerous cakes for me over the years for my girls birthdays and I’ve loved each and everyone of them. But, I’d left it a bit late to order one, and given its the holidays I decided to try my hand at a cake myself.. or rather, do one with the girls. Whilst I cook often, and think I’m ok at it (kids eat most of what I put in front of the, Ron eats everything I put in front of him, but he hates waste, so will eat it whether he likes it or not! ), I rarely bake. I’m a bit of a throw it all together type of cook so generally limit myself to baking flapjack or scones. I think to bake successfully (cakes etc) you have to be precise or it all goes terribly wrong in my experience, and I’m not too good at precision! But I thought, hey, no matter how it turns out, I’ll just say the girls did it and everyone will think its wonderful. My girls certainly have their priorities right .. 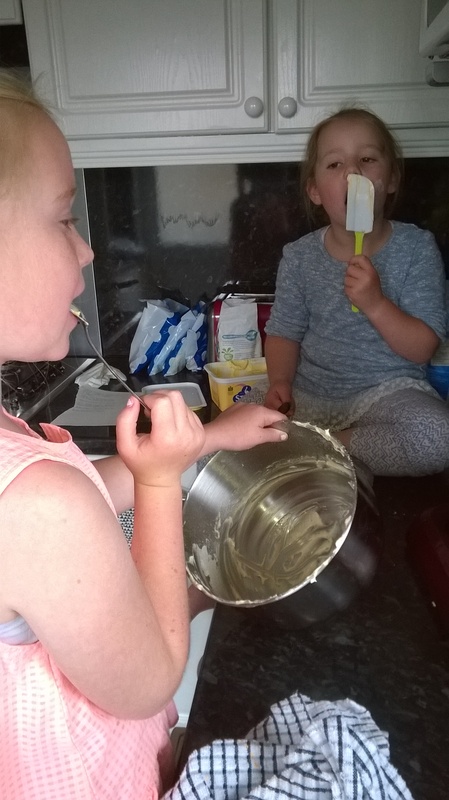 In their own true style they decided on at the outset was who was going to get to lick the spoon and who was going to get to scrape out the bowl! I know its the best bit, and boy did they make the most of it. Decorations were in order – I had in my mind to make lovely pretty roses, and cut outs of flowers and butterflies – all looked so simple in the pictures. In reality.. not quite as easy as I thought, but we gave it a go and overall, did a reasonable job. 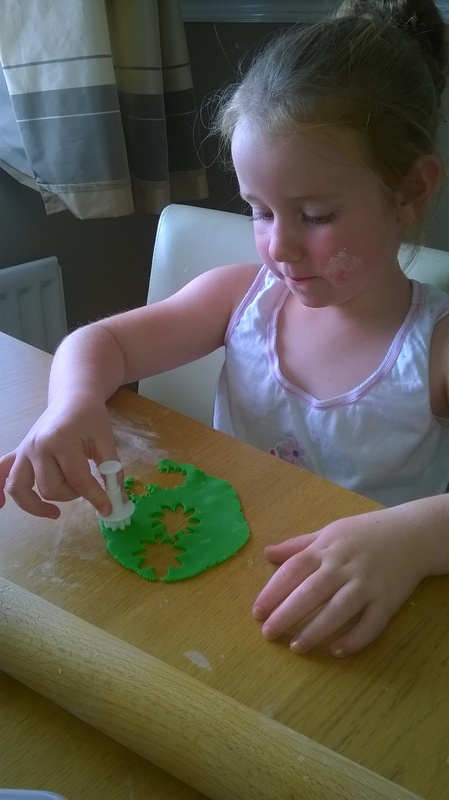 The girls loved using the cutters and we had enough to decorate 3 cakes never mind one. I actually had a try at covering the cake in icing, not the most professional job, but given it was my first time I was pretty pleased with myself. We sat around the cake together, deciding on placement of roses, butterflies and flowers, stood back and admired our handy work. Ok, so entry in to the Great British Bake off is not going to happen anytime soon – but I think Grandma loved her birthday cake so much more than anything professional I could have had made for her. There’s nothing quite like something thats home made, slightly wonky, but done with much love and effort. The finished article, made with love (and lots of buttercream) and presented with a rather charming if quite loud rendition of Happy Birthday To You from the girls!